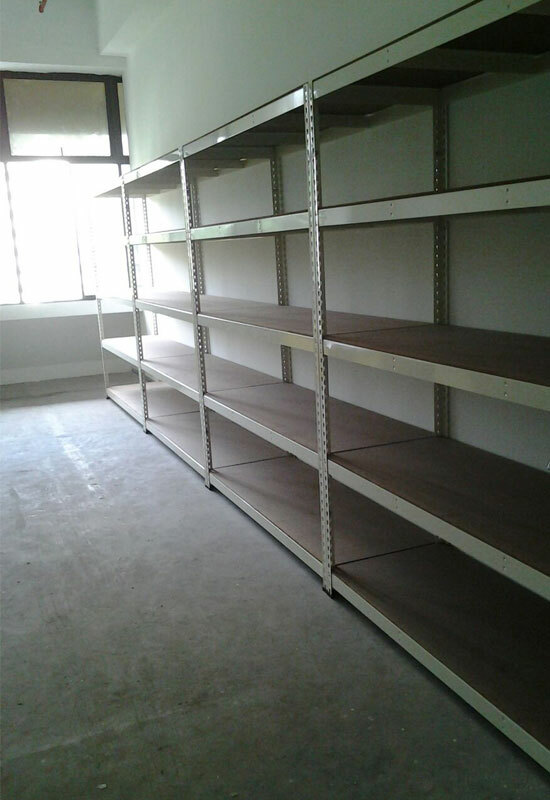 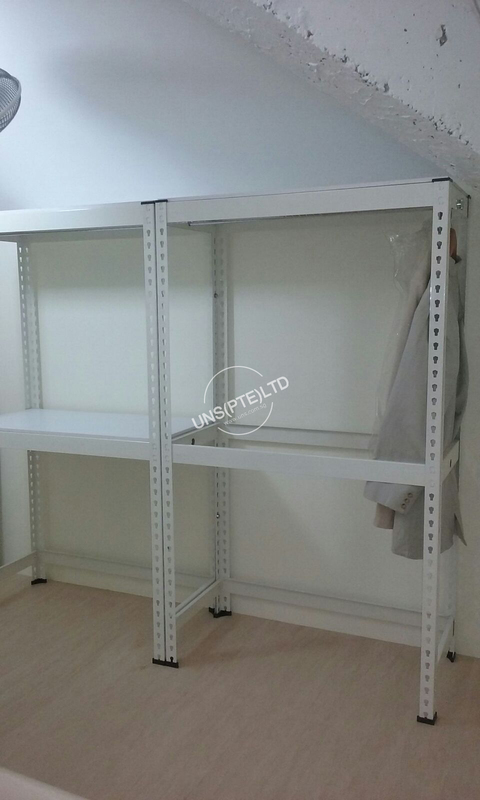 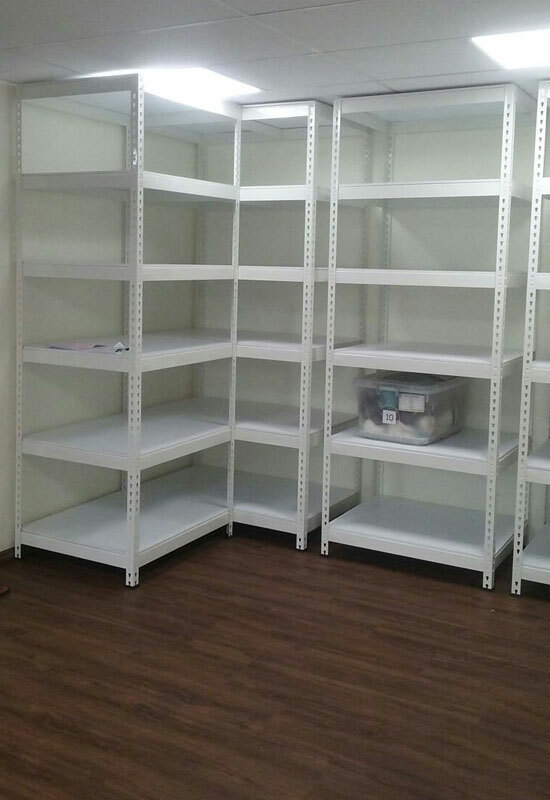 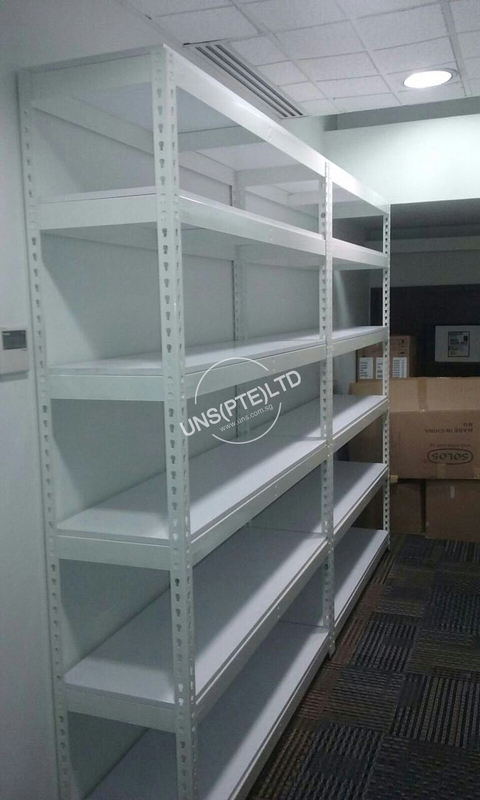 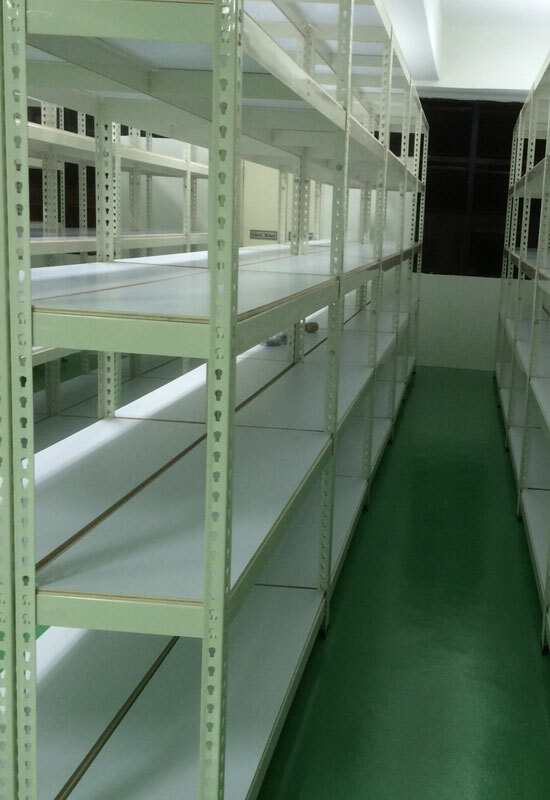 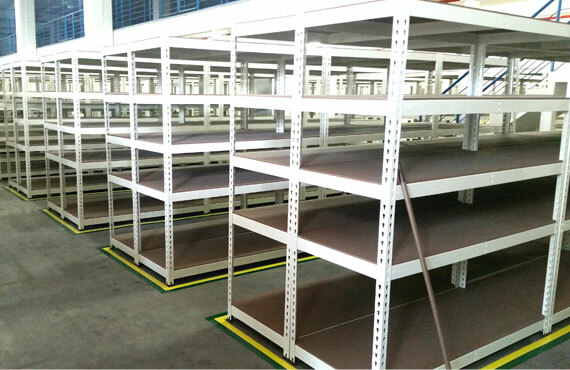 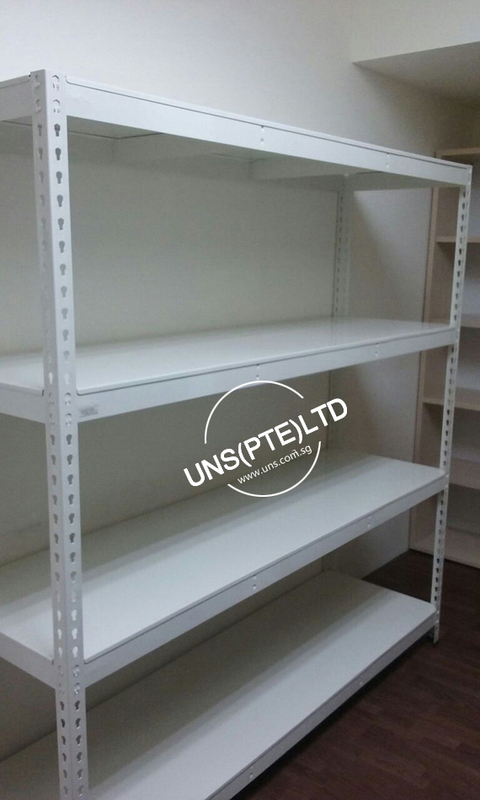 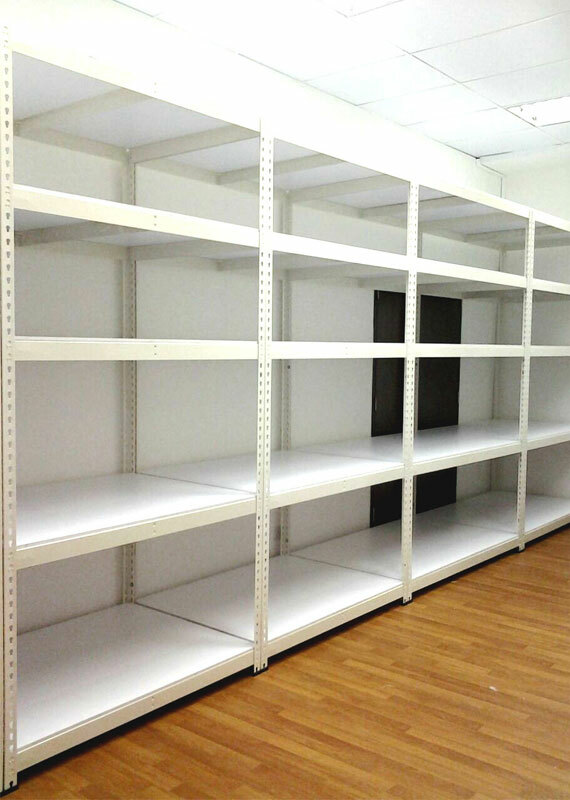 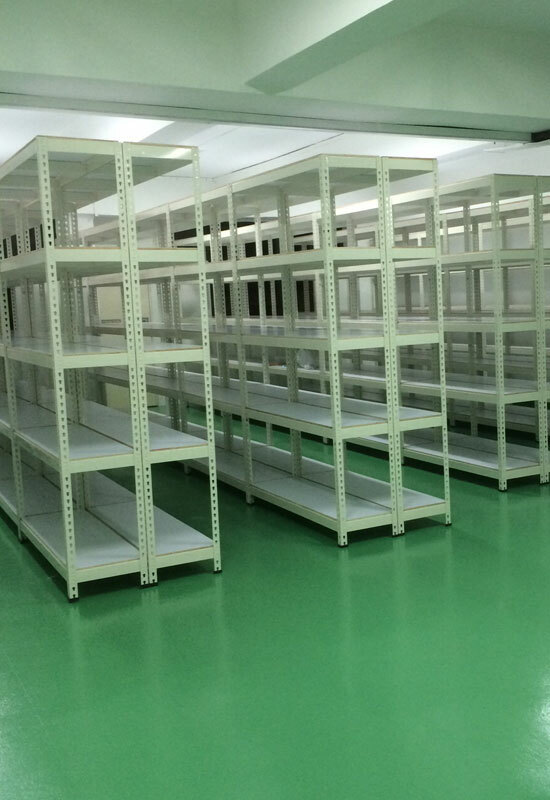 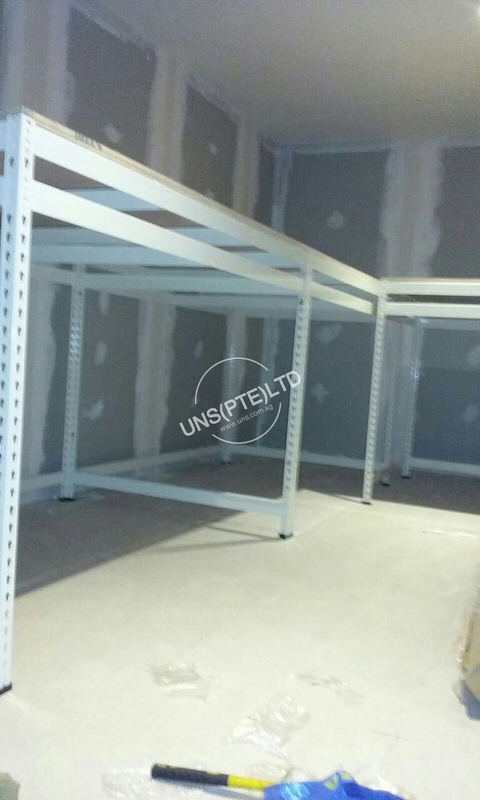 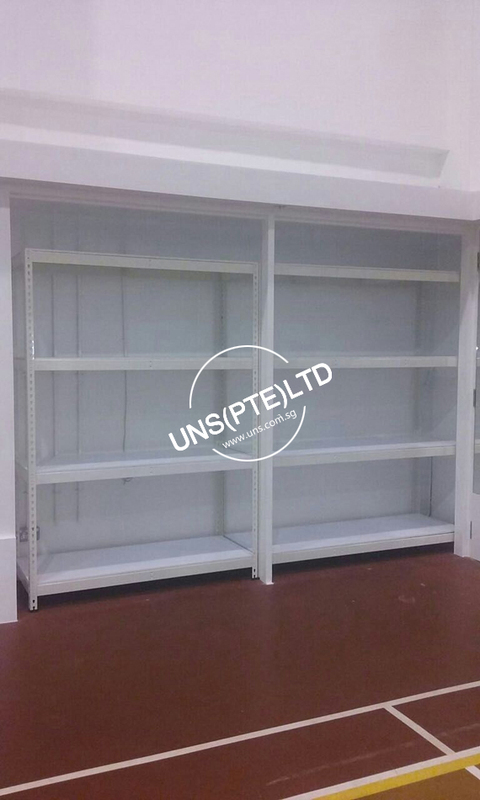 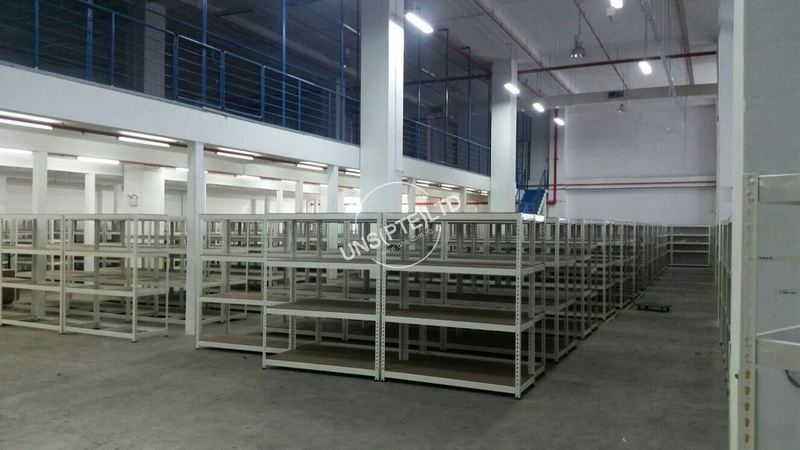 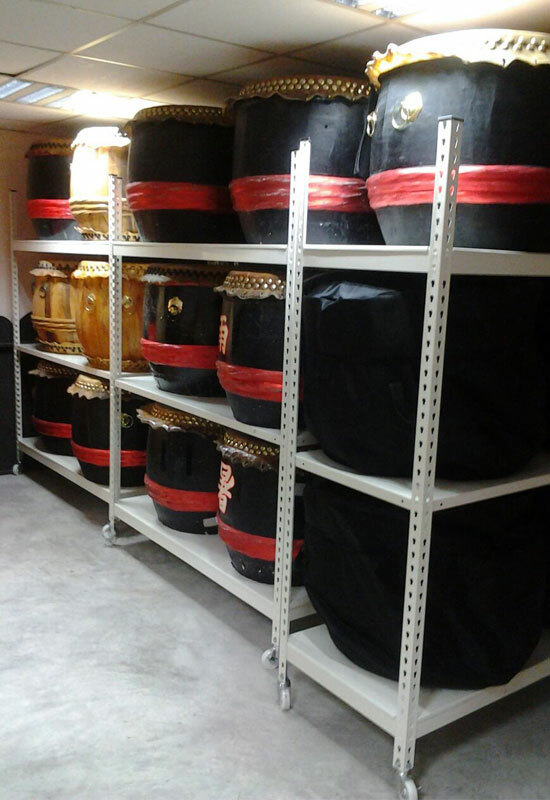 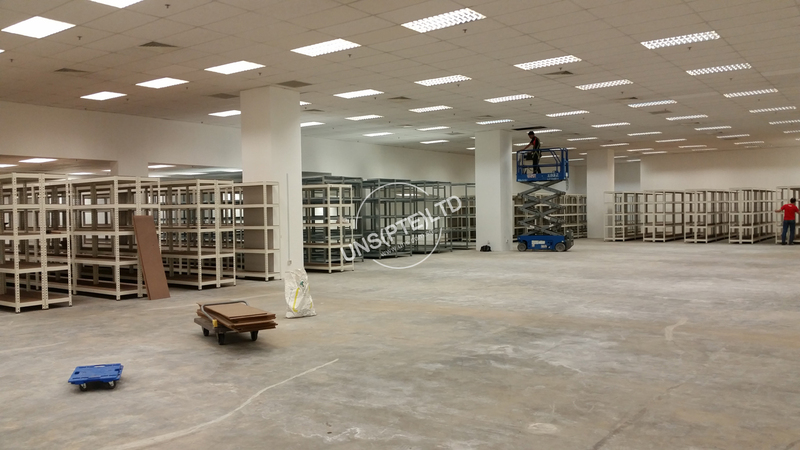 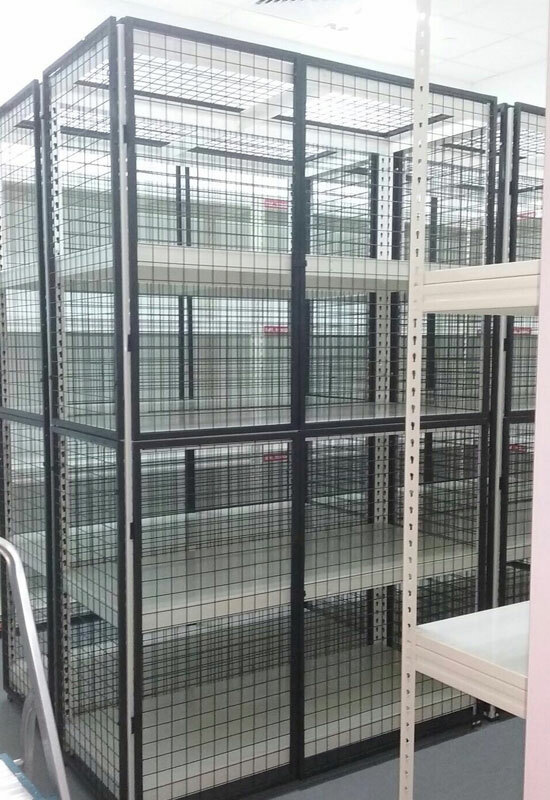 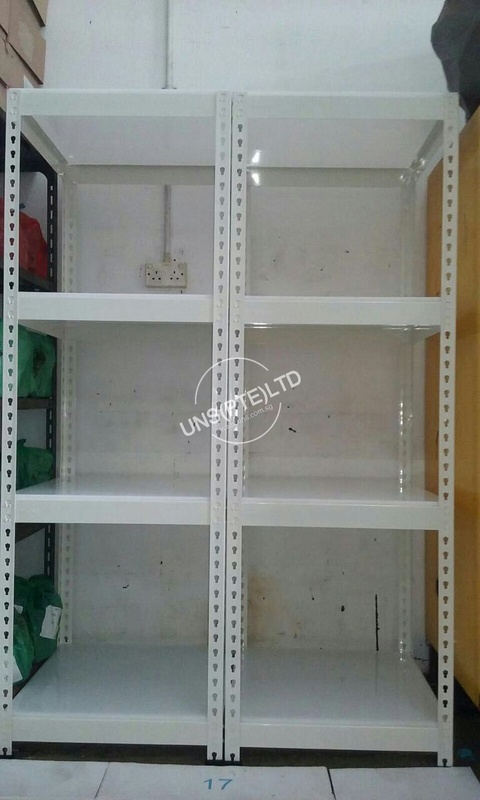 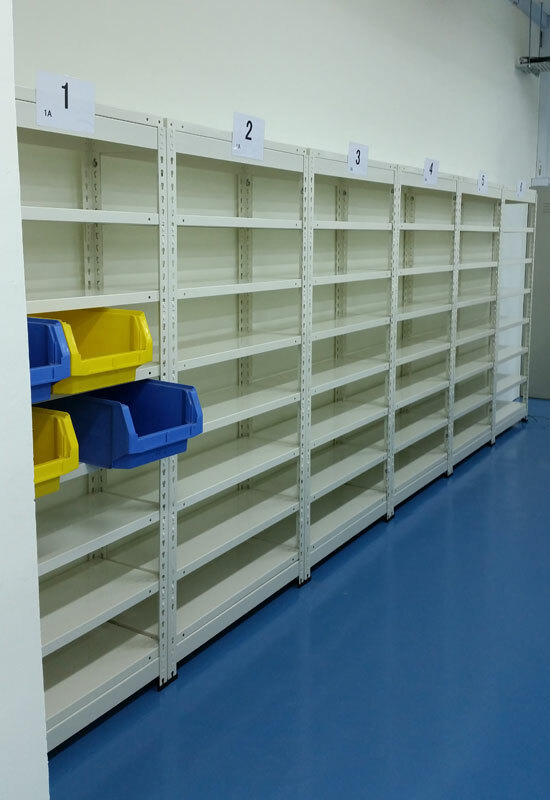 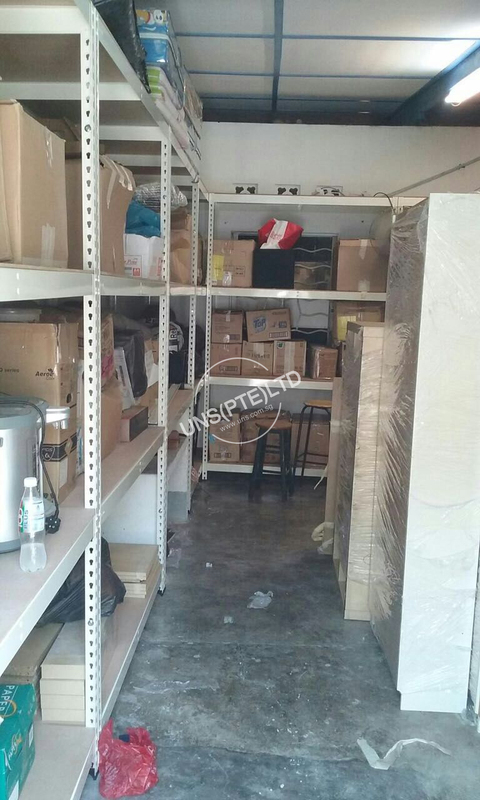 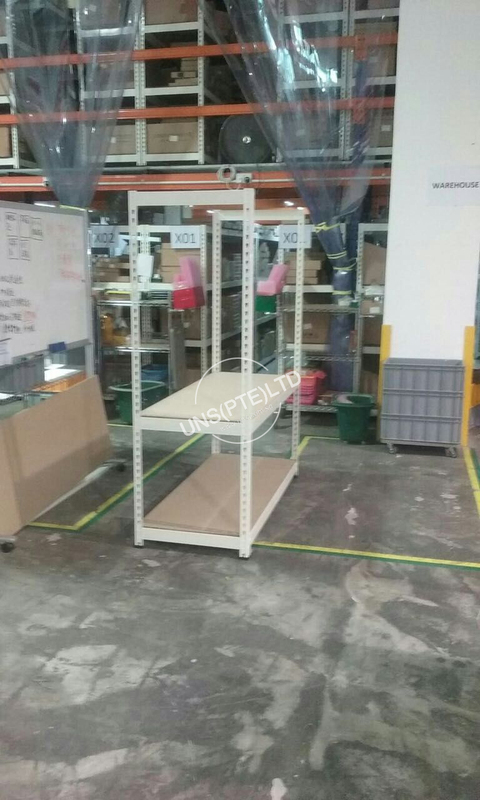 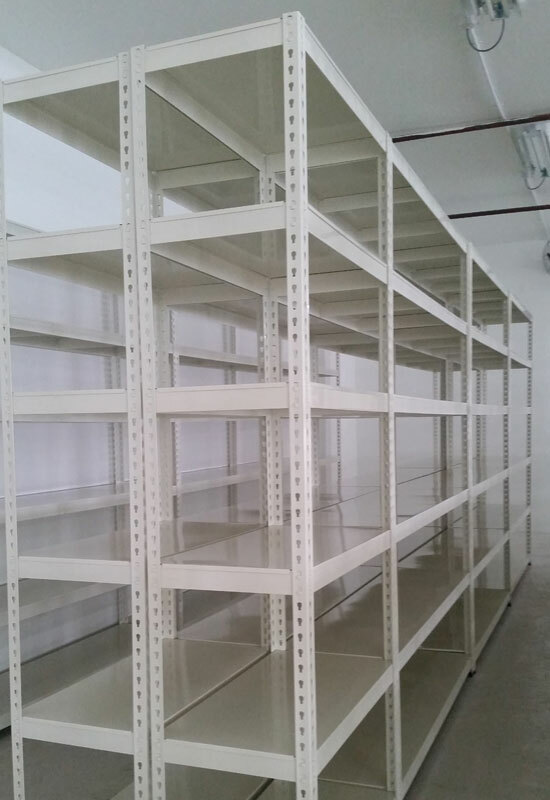 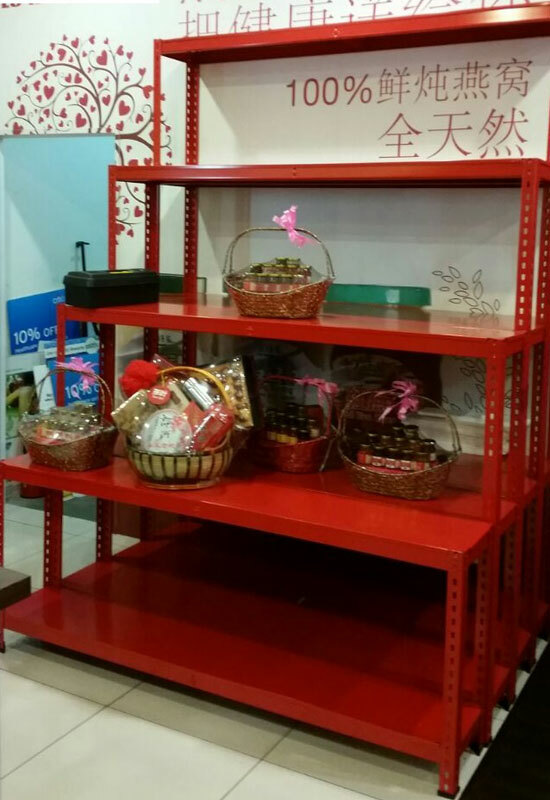 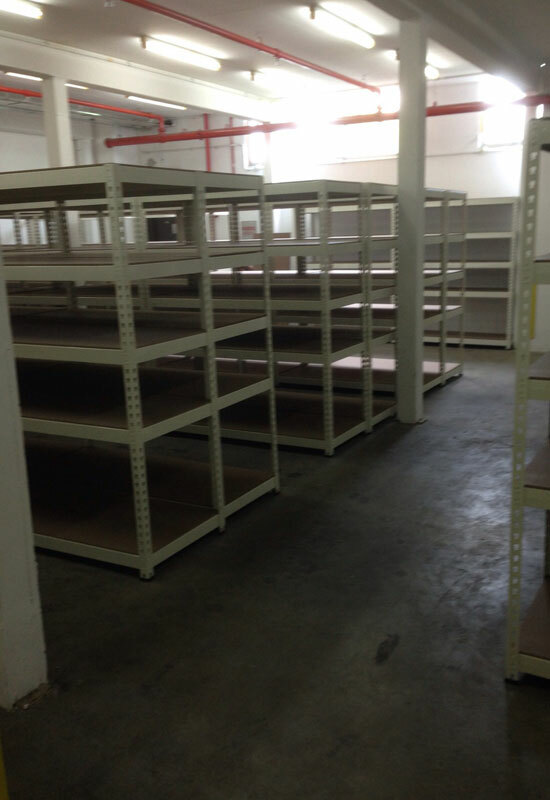 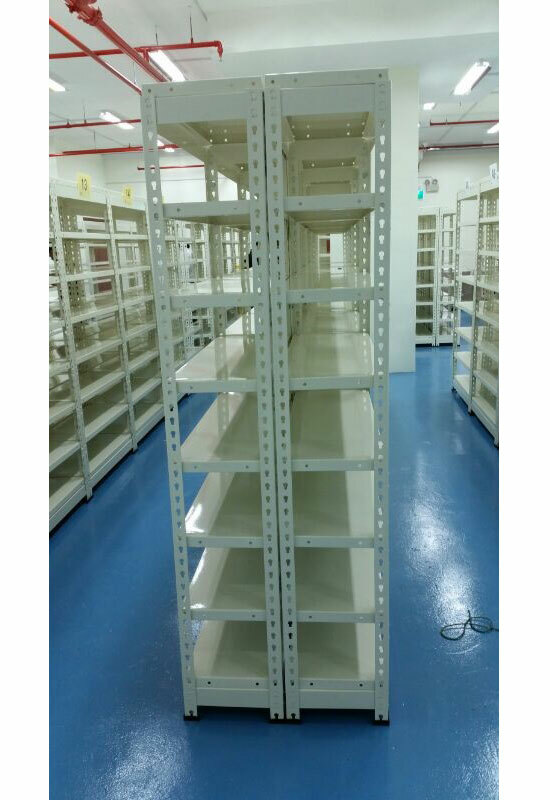 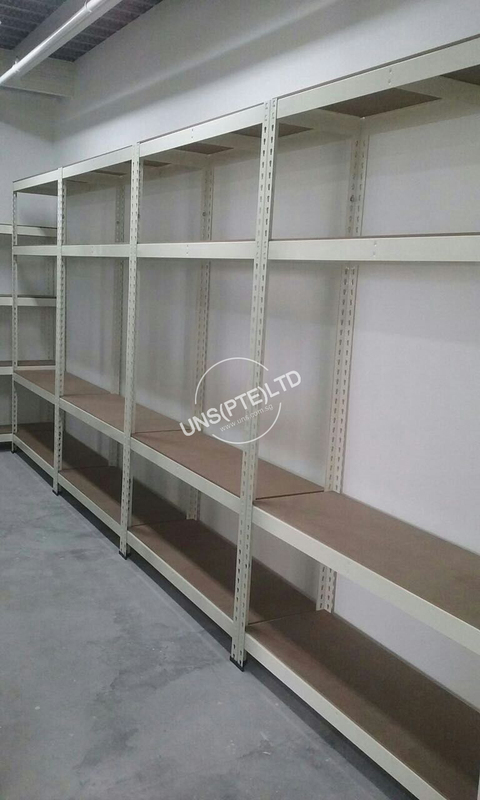 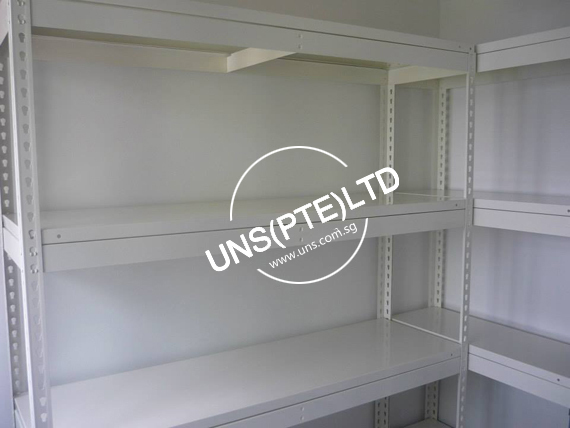 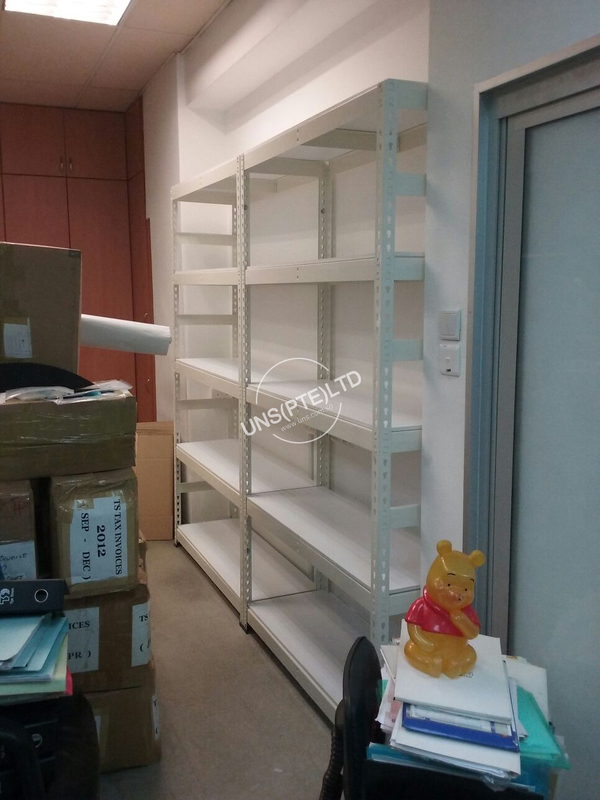 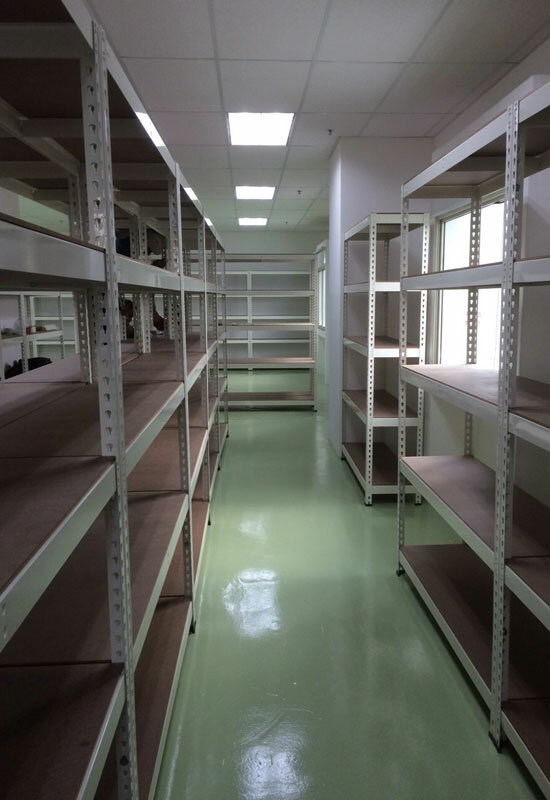 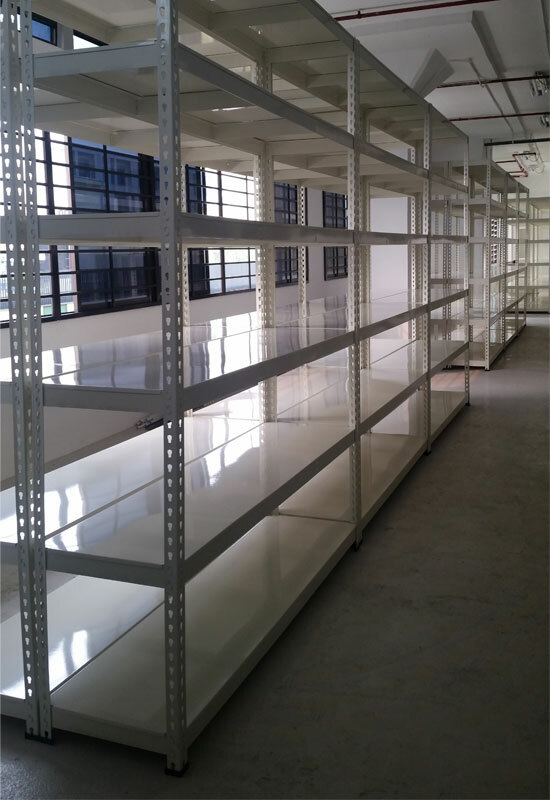 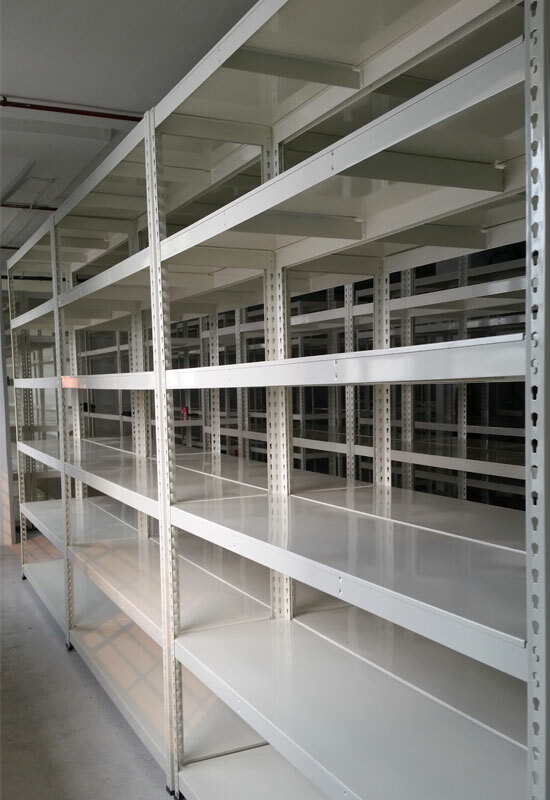 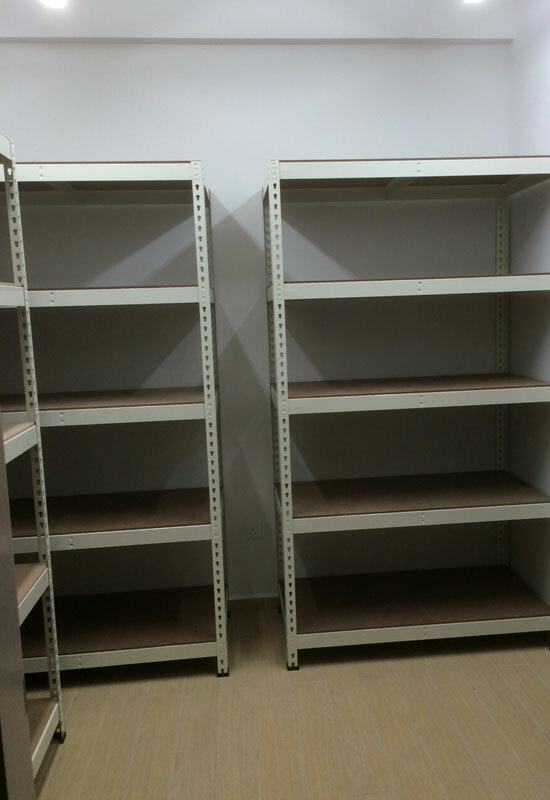 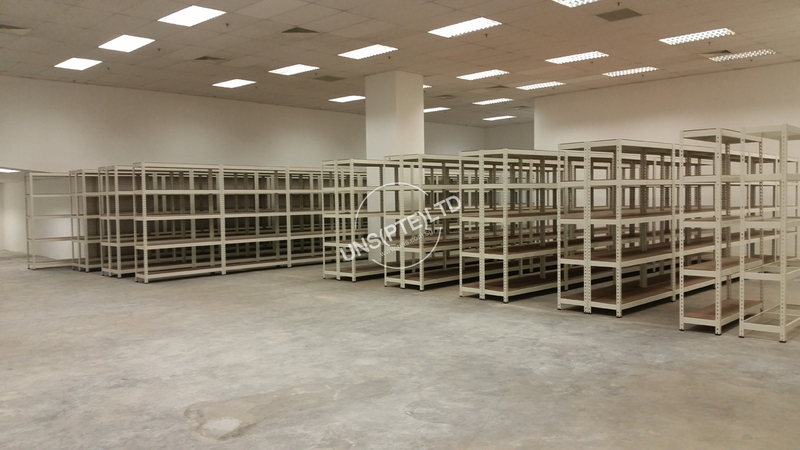 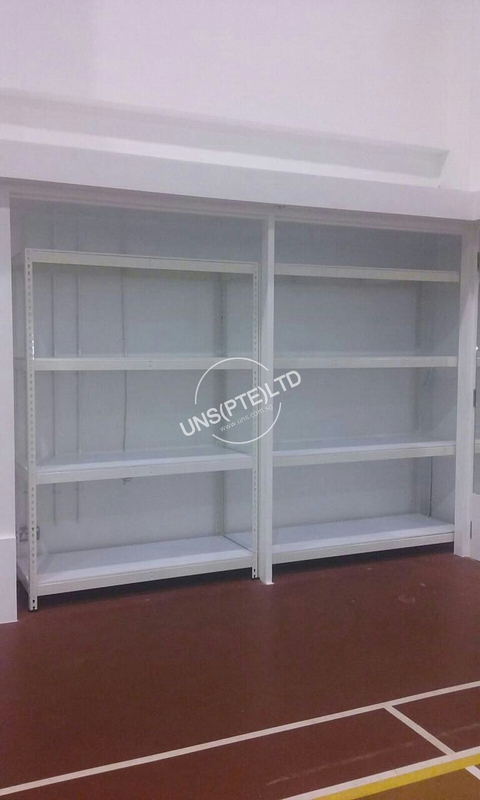 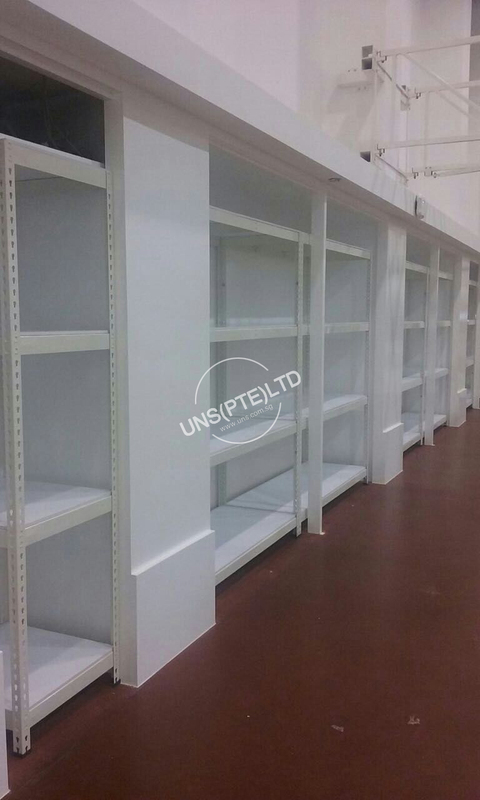 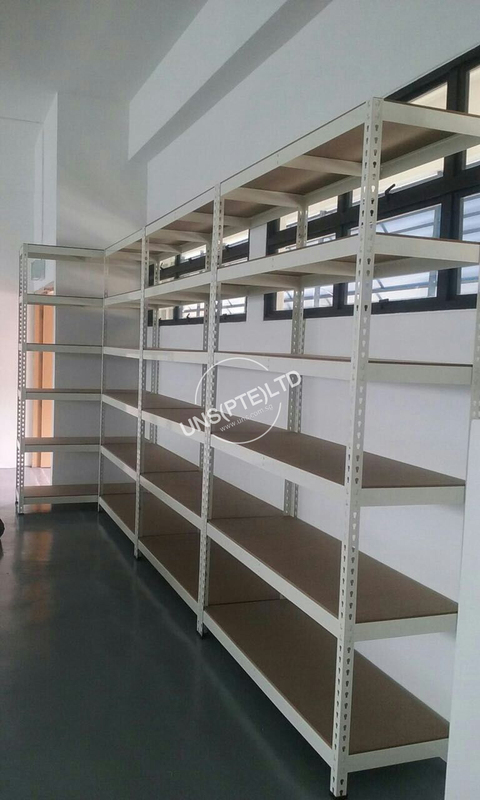 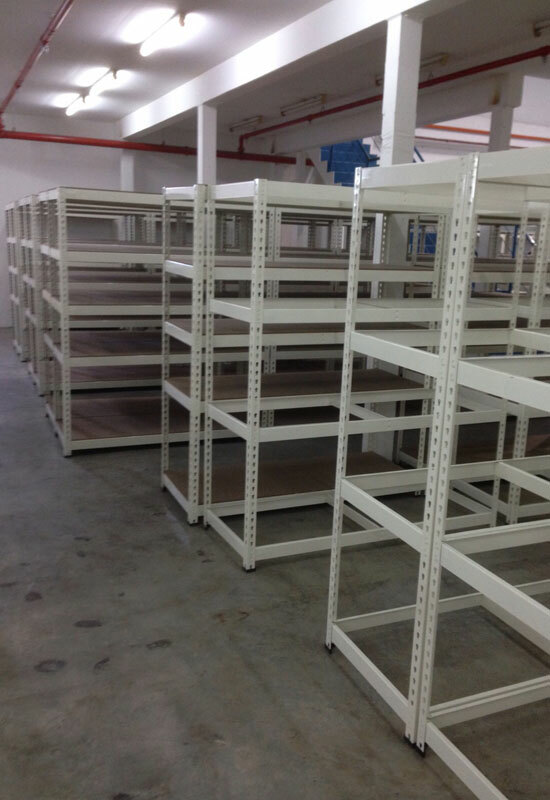 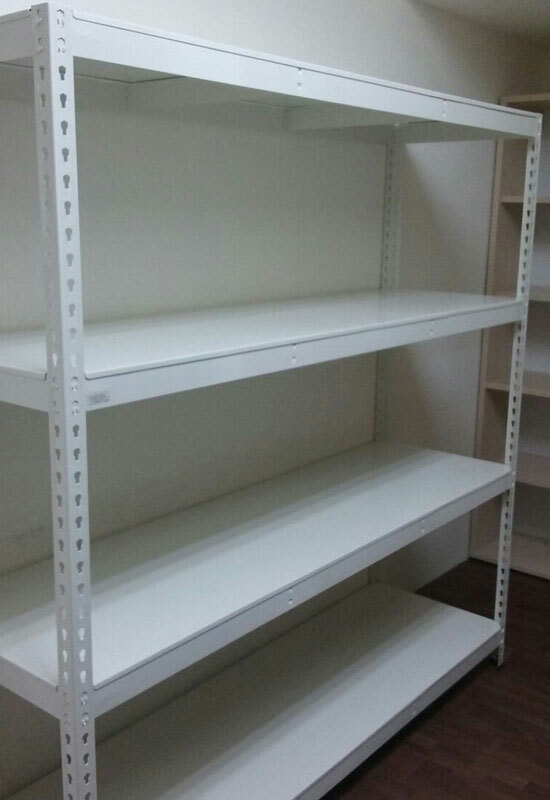 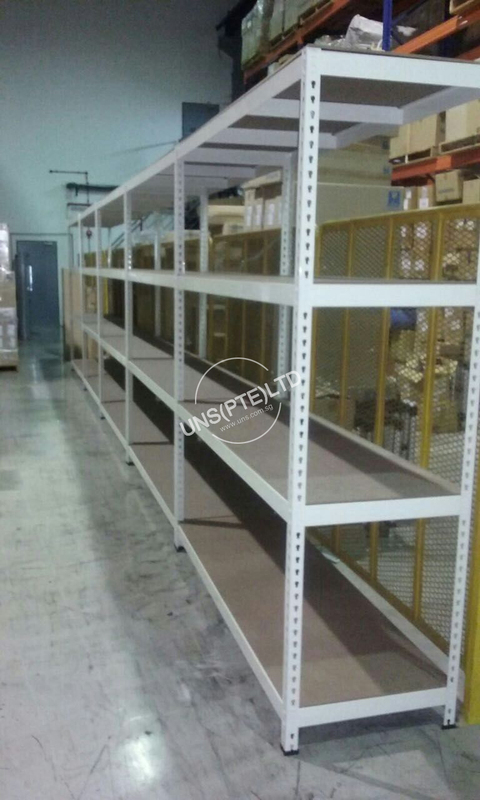 UNS PTE LTD shelving & racking system revolution by introduce and mass market them in Singapore Specialised in the manufacture of various types of racks fit for Residential and Commercial usage. 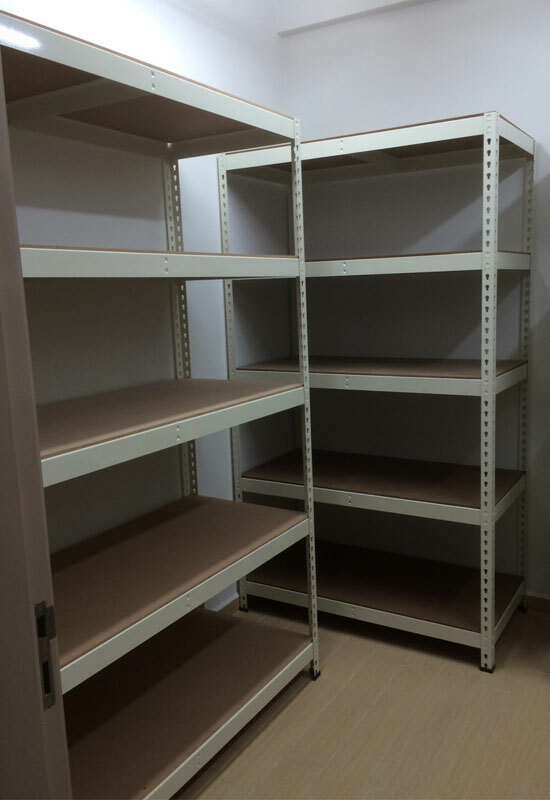 We carry a huge variety of products that can be customised with the standard Depth, Length and Height to meet your Household Shelter / Bomb Shelter / Office / Warehouse requirement. 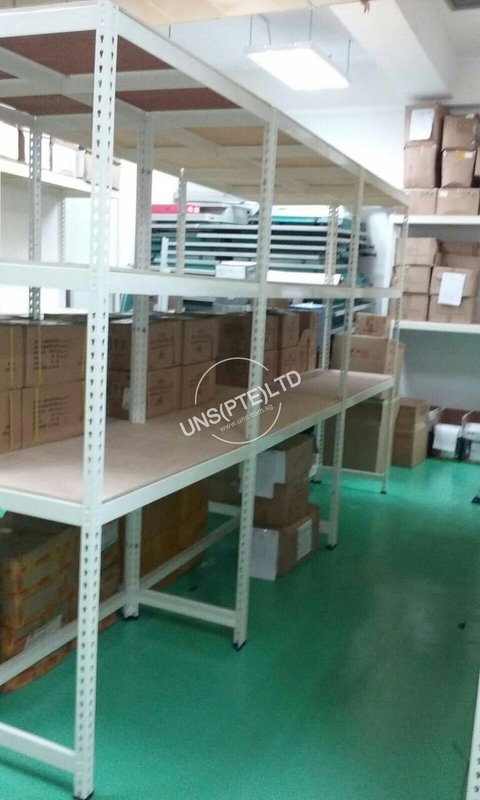 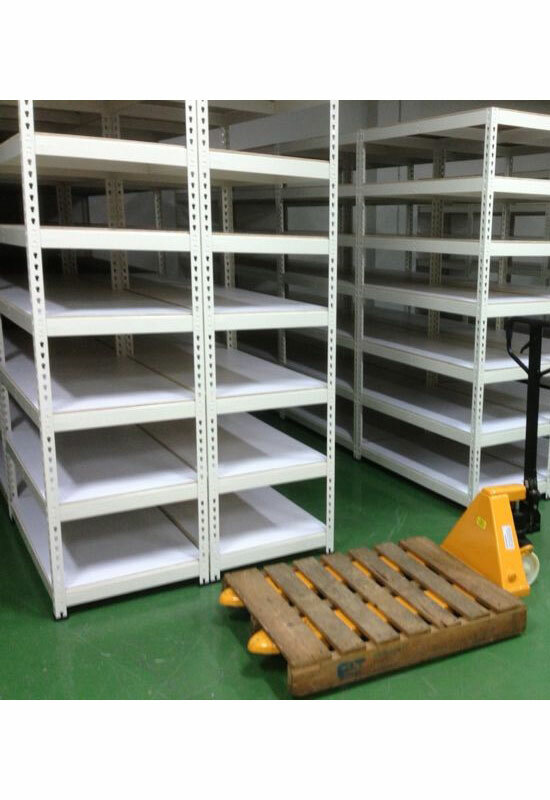 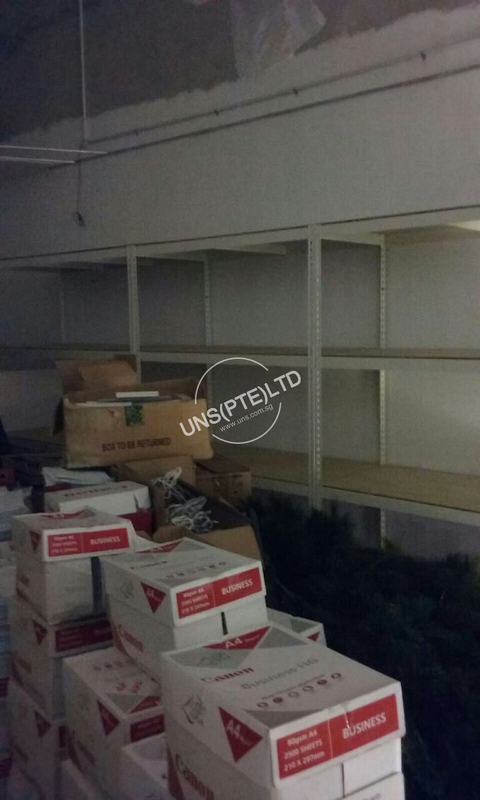 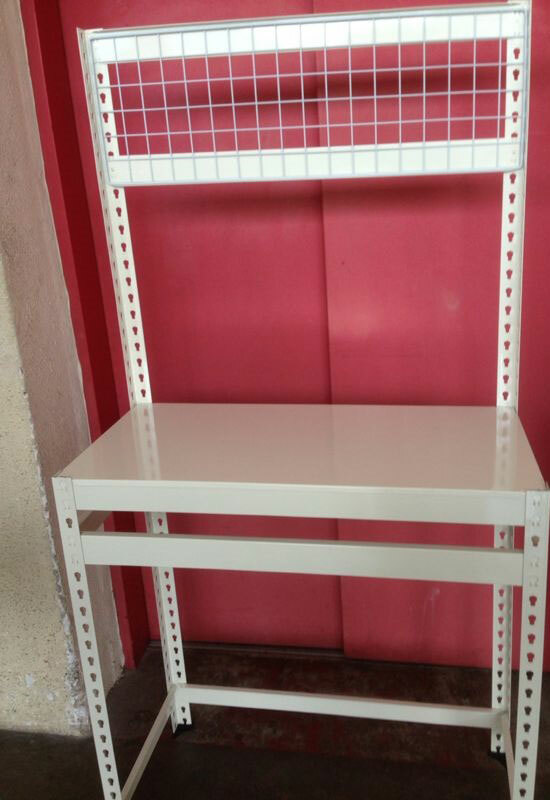 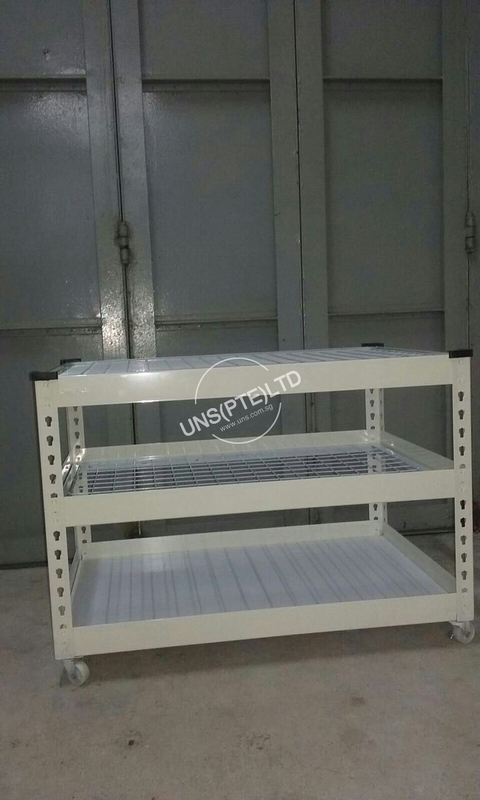 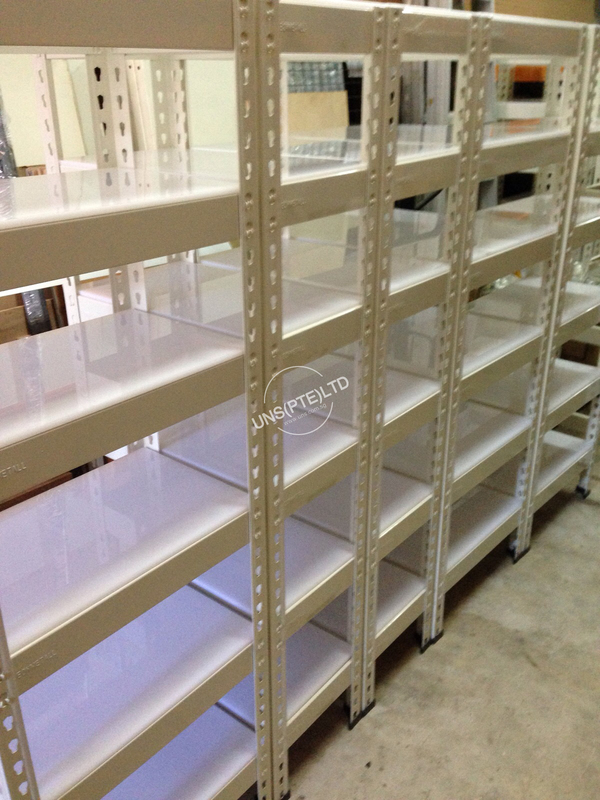 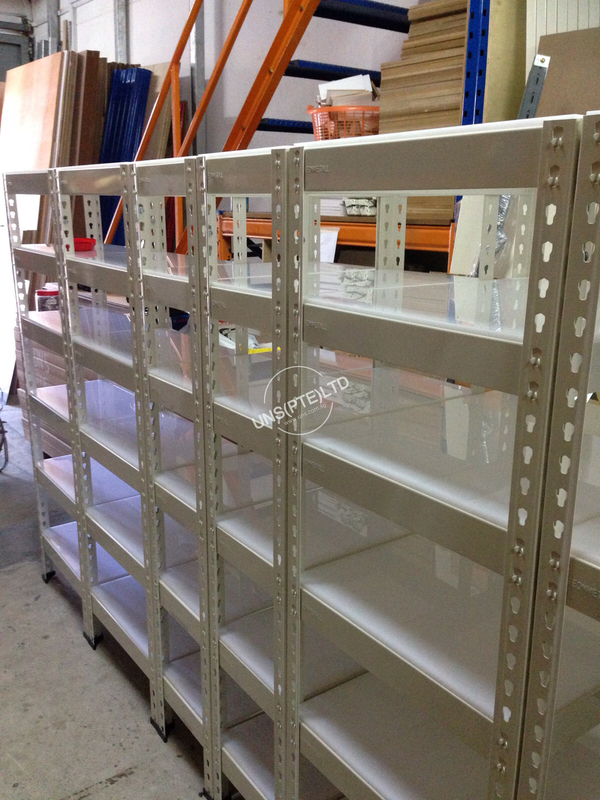 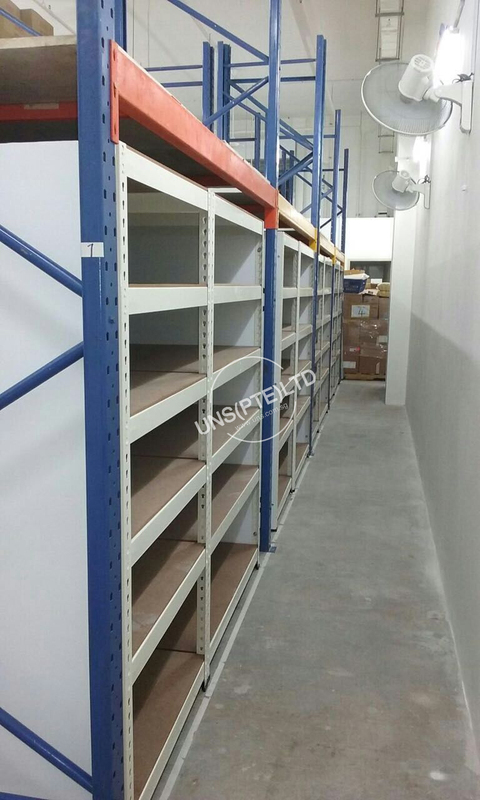 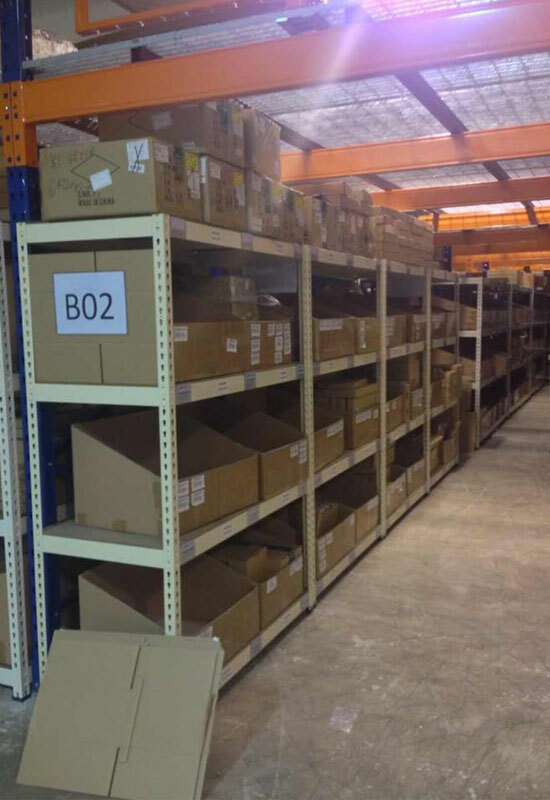 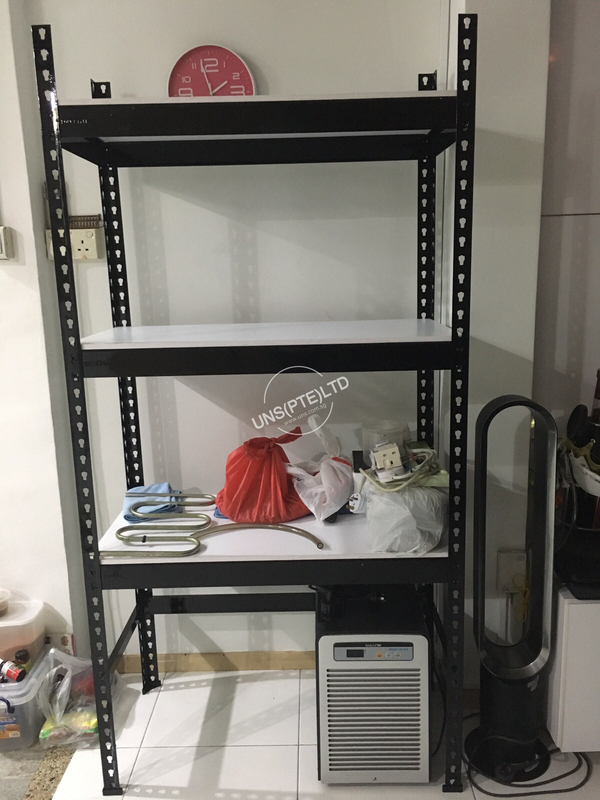 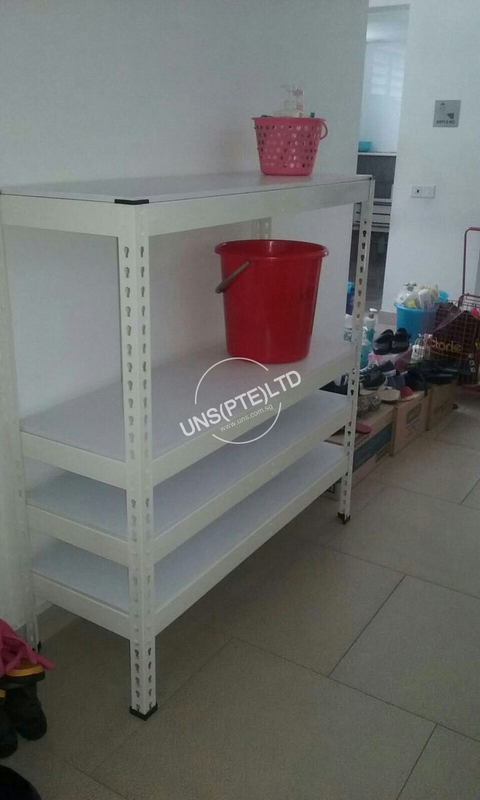 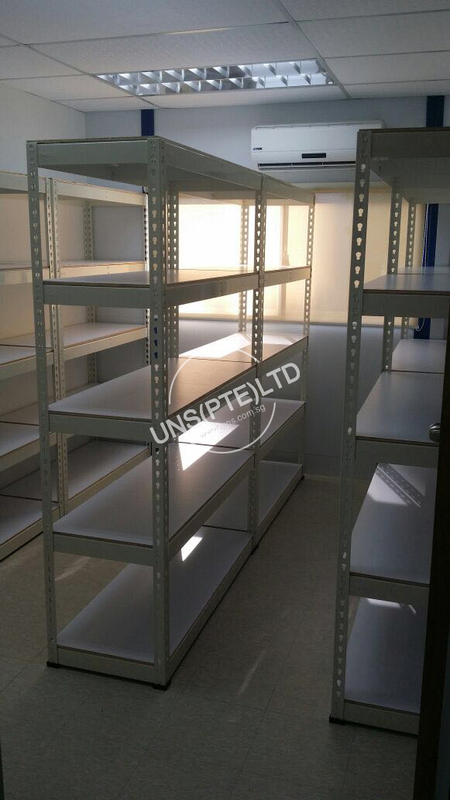 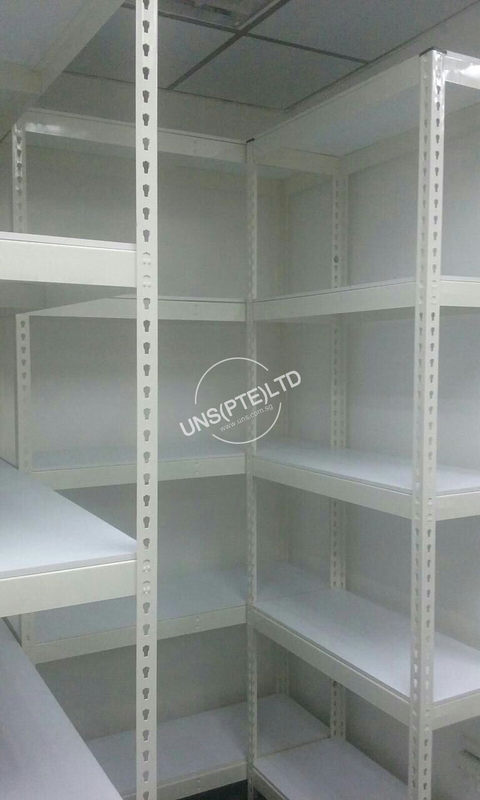 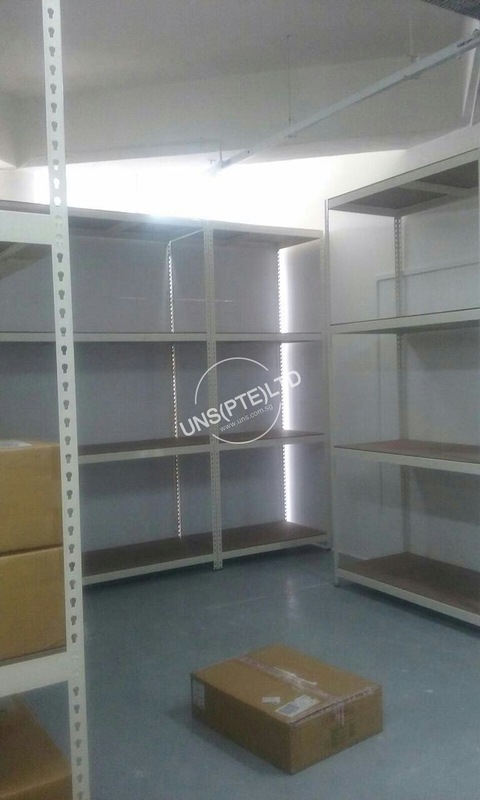 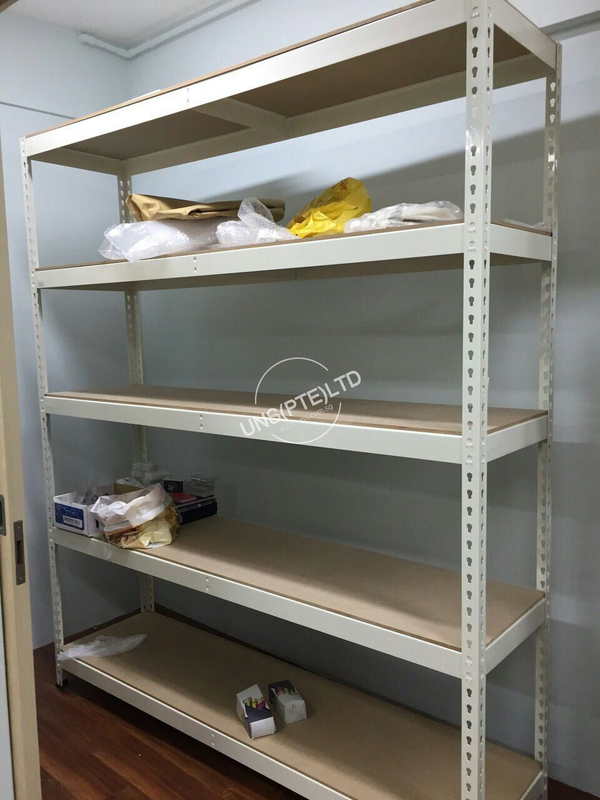 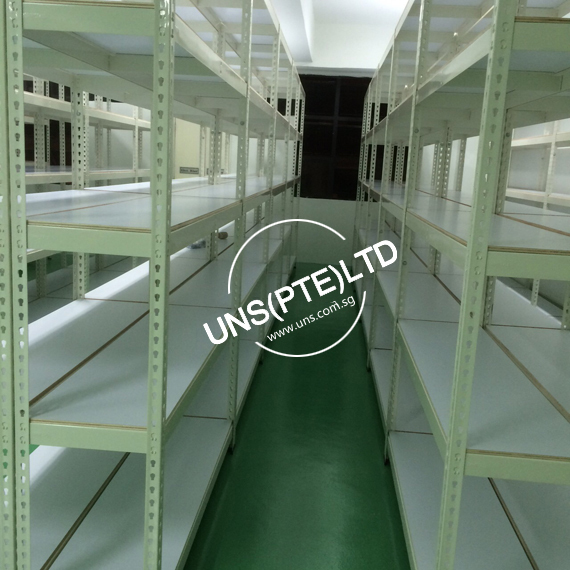 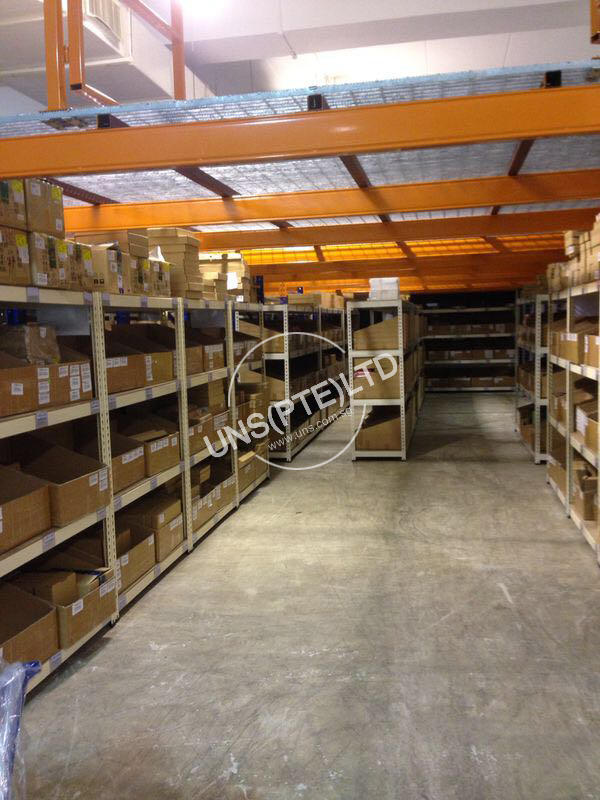 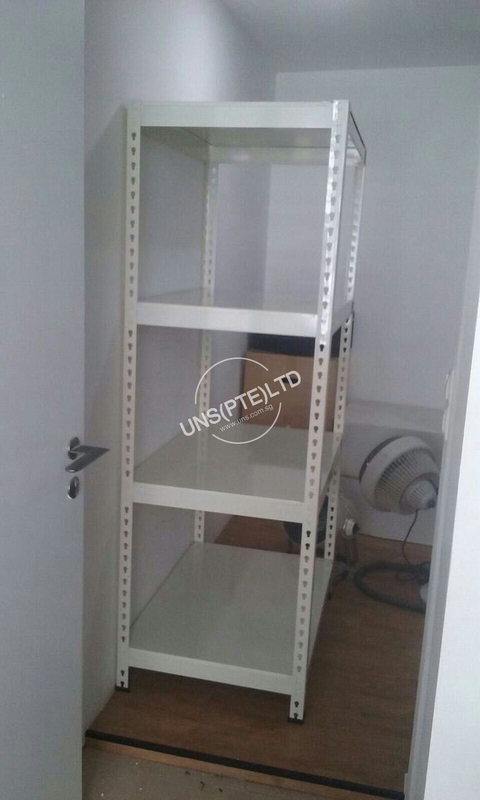 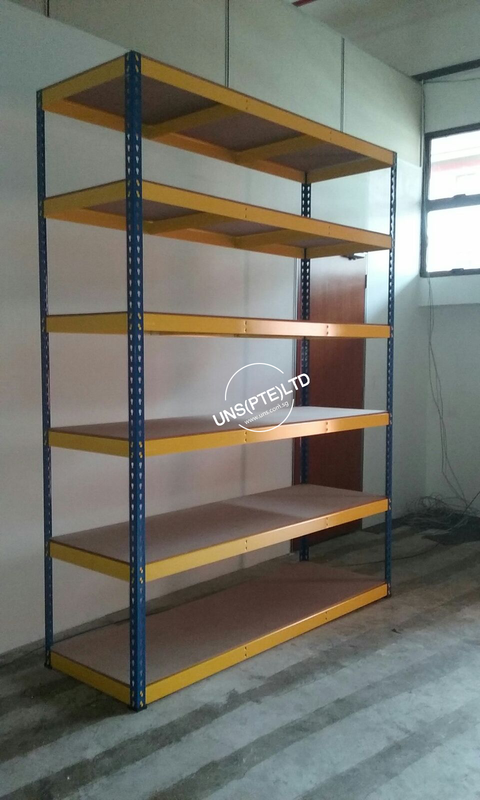 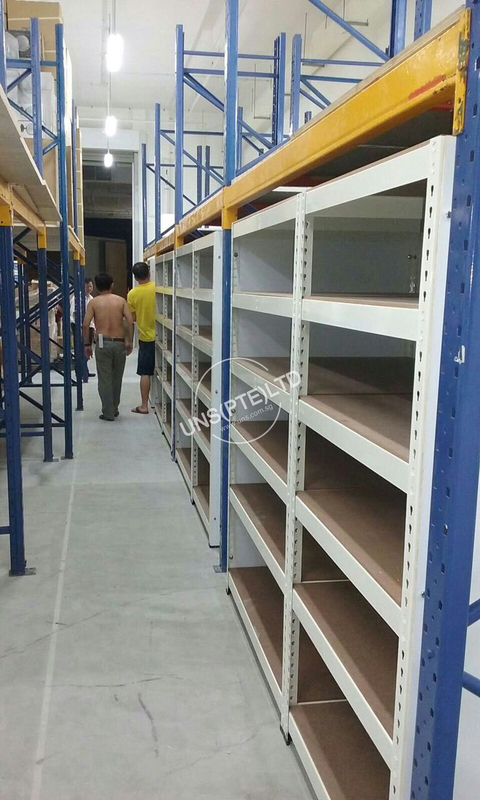 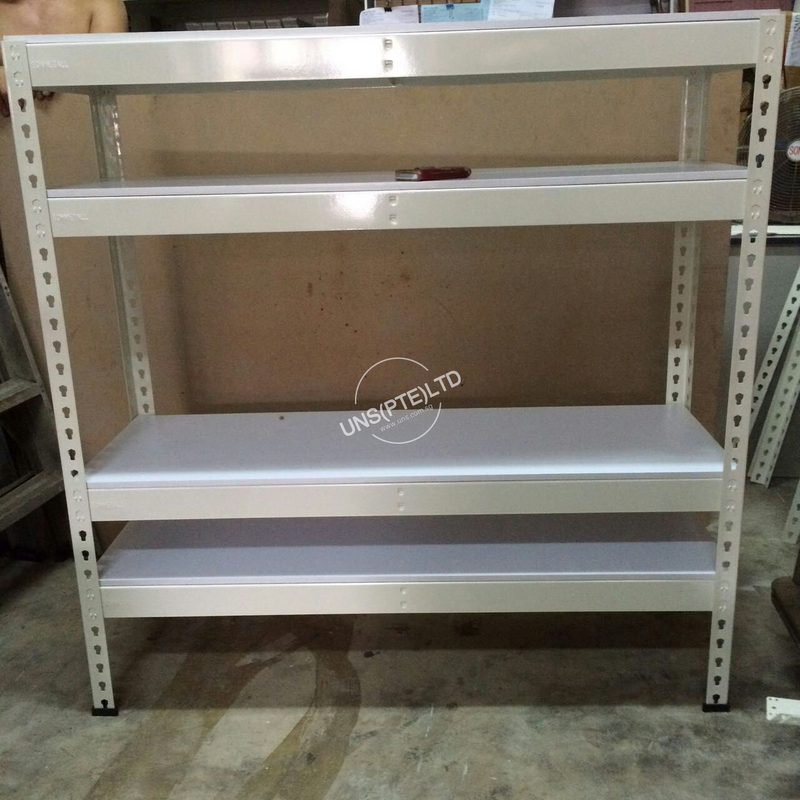 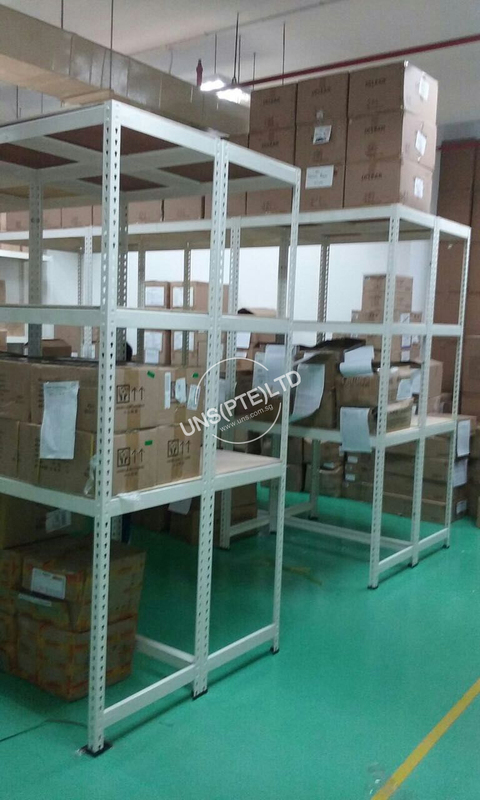 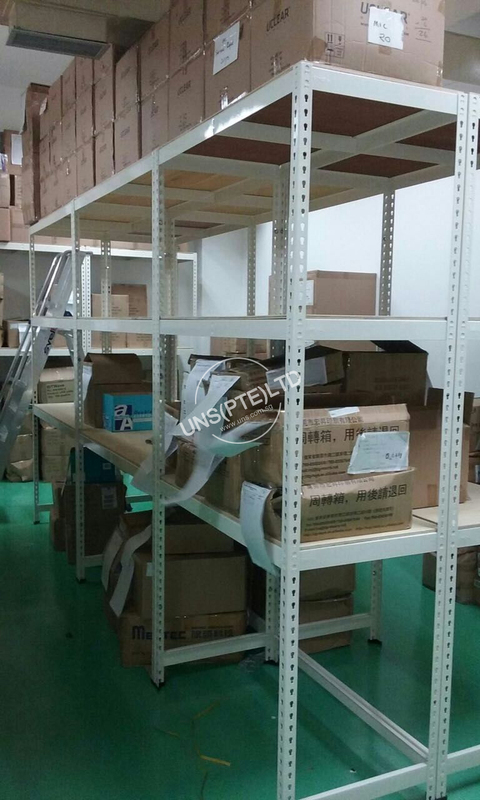 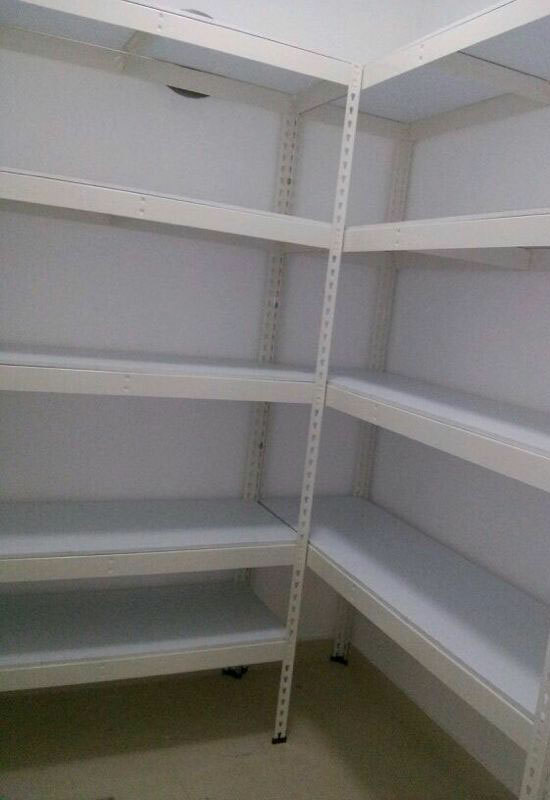 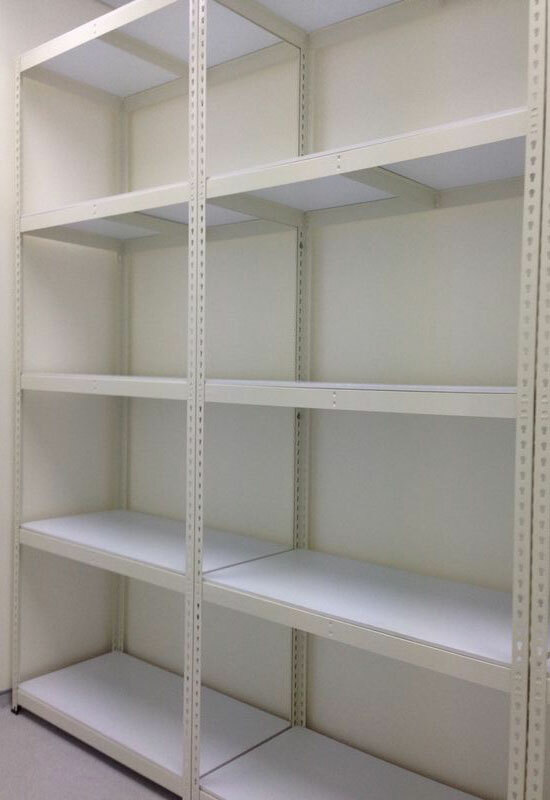 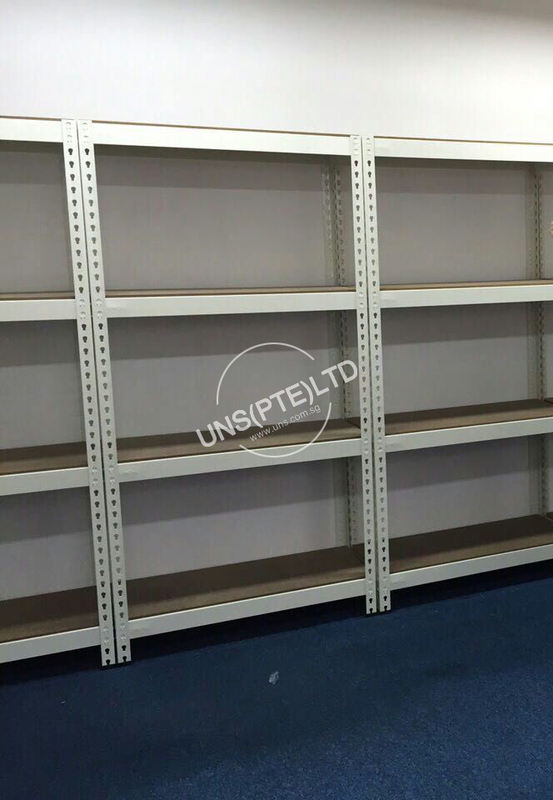 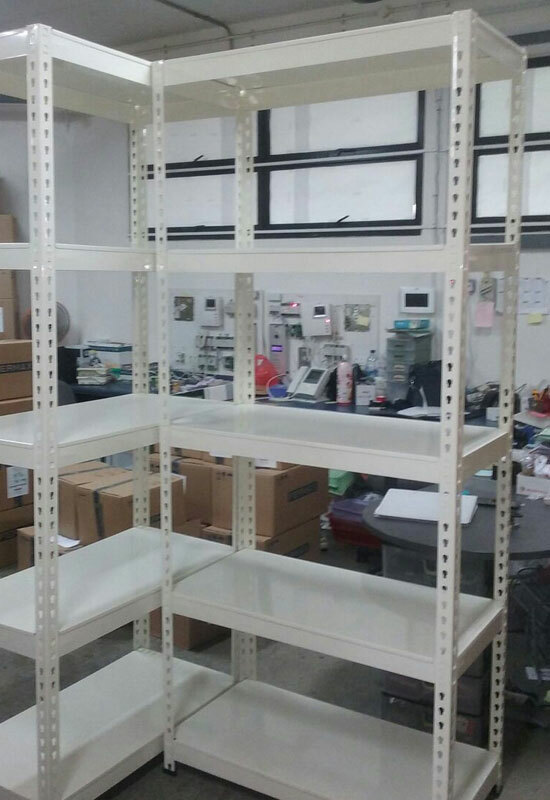 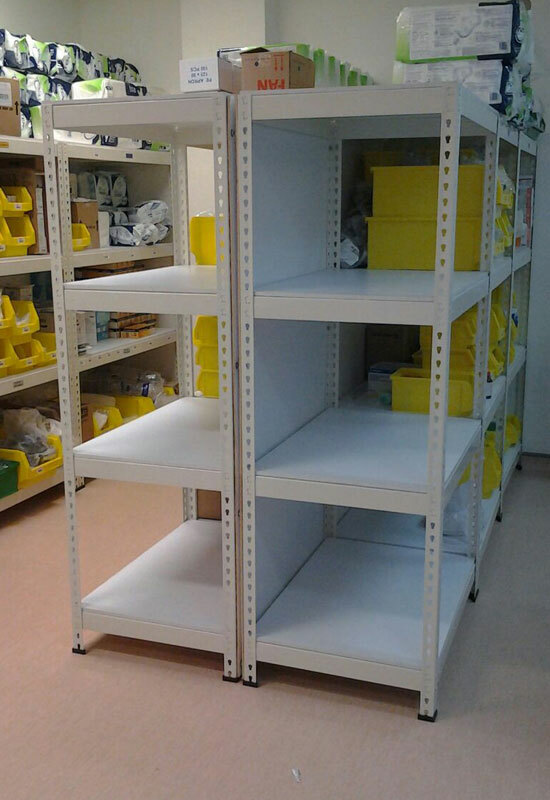 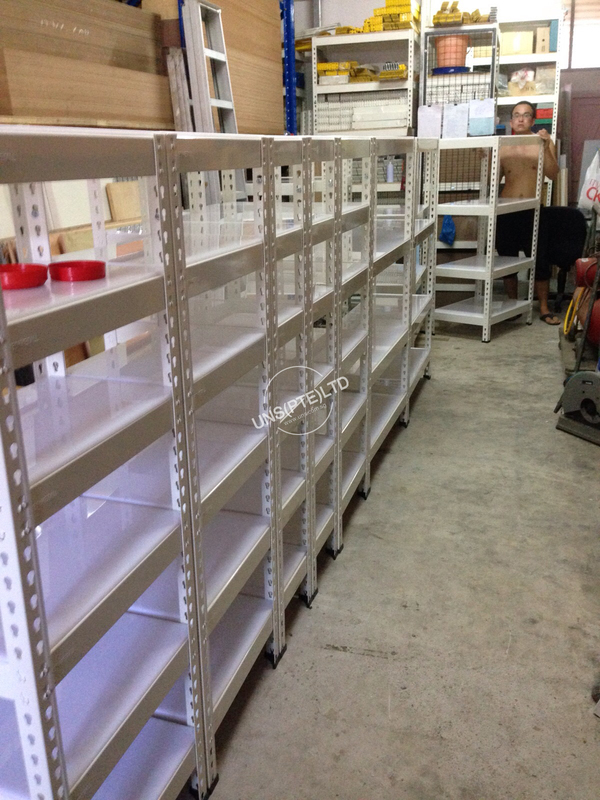 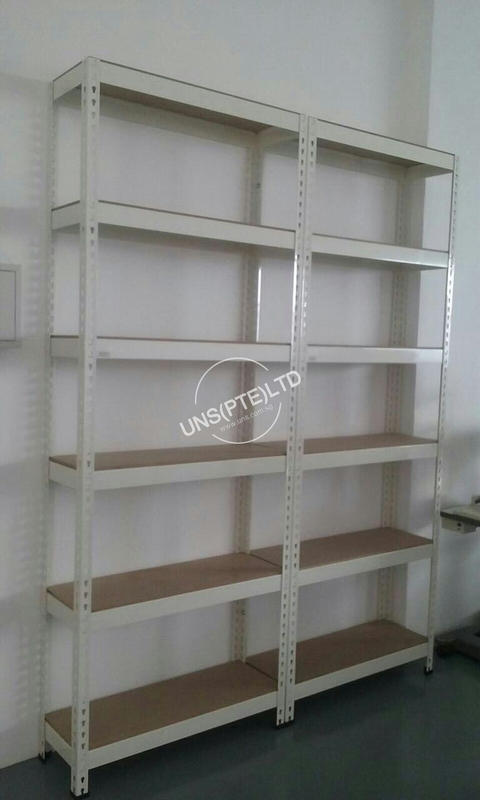 These metal rack are suitable for both light storage and medium duty warehouse shelving purposes. 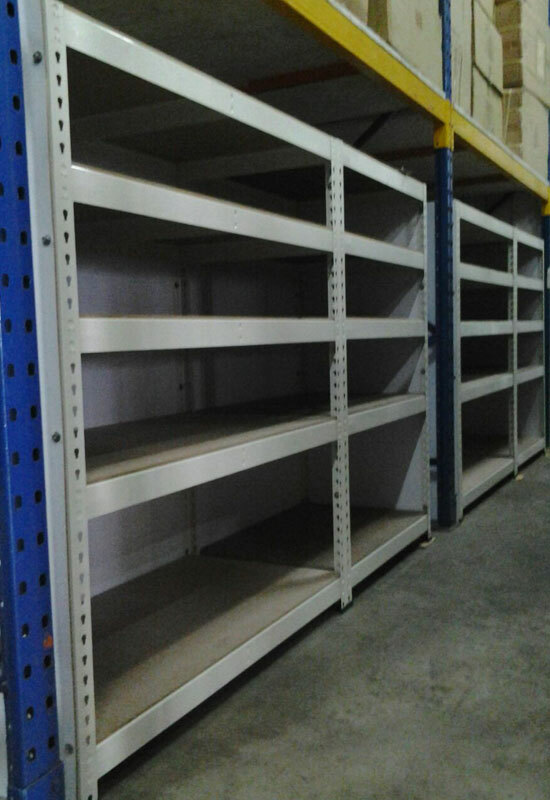 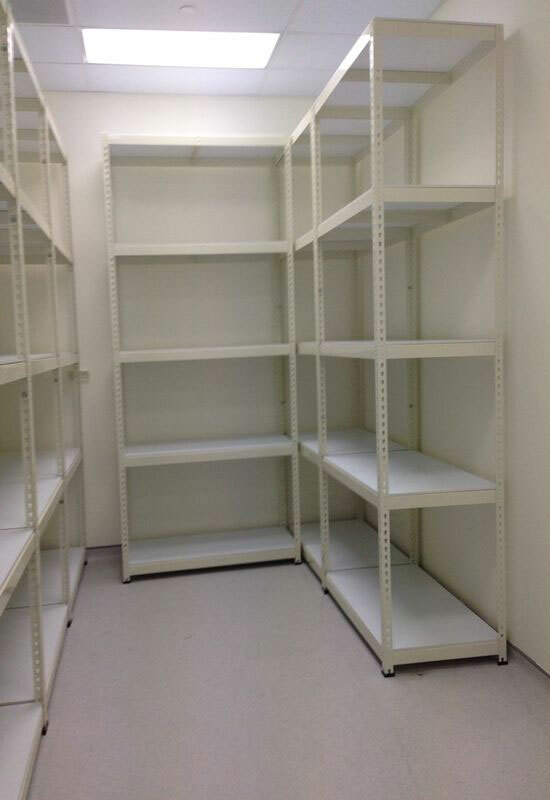 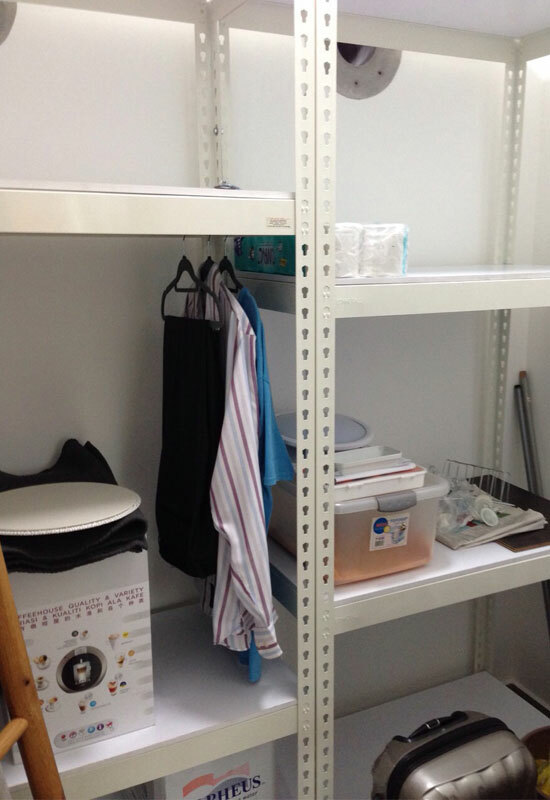 The idea of racking maximizes your storeroom storage spaces, and making the whole premises neat and tidy. 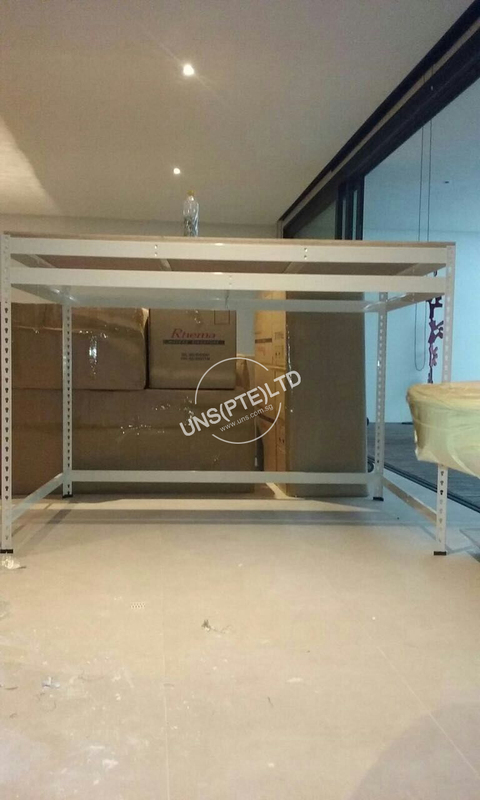 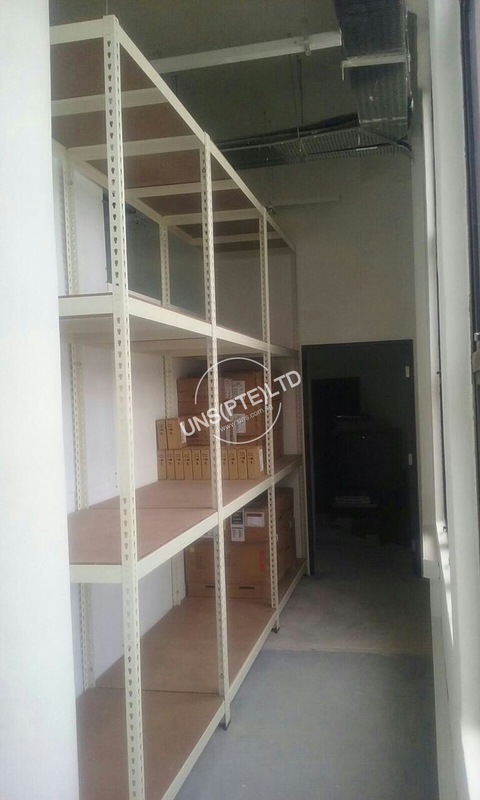 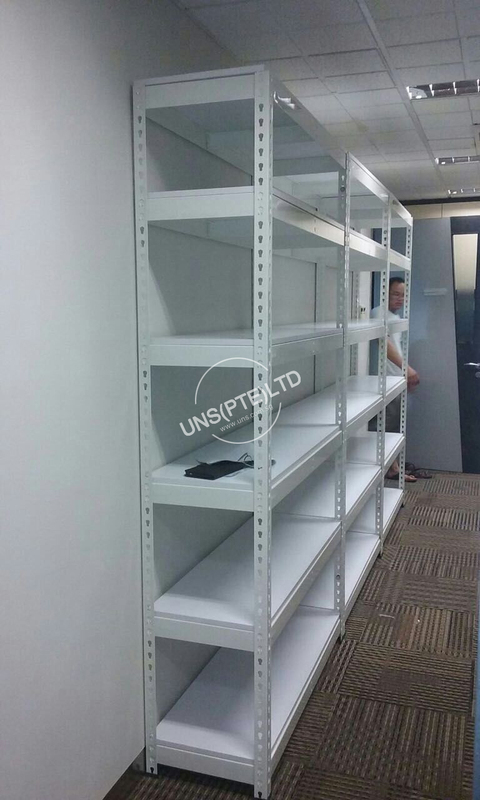 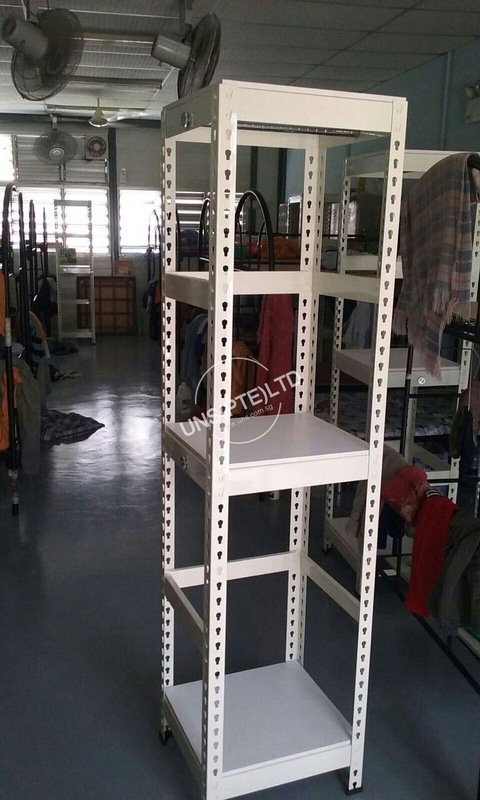 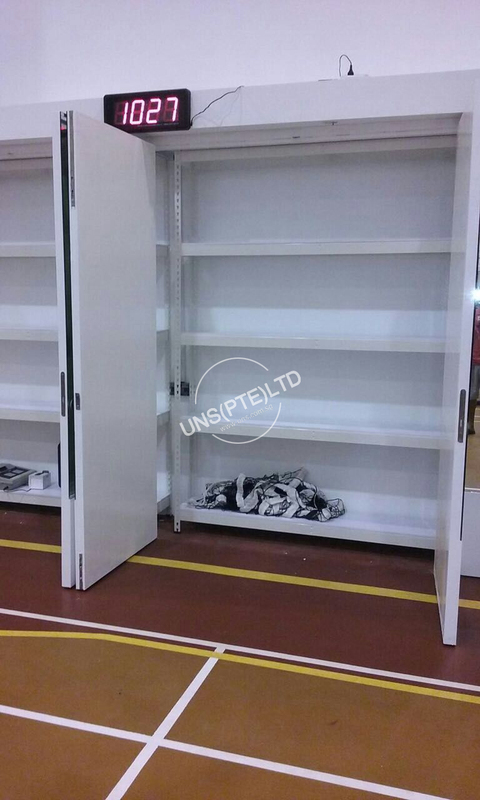 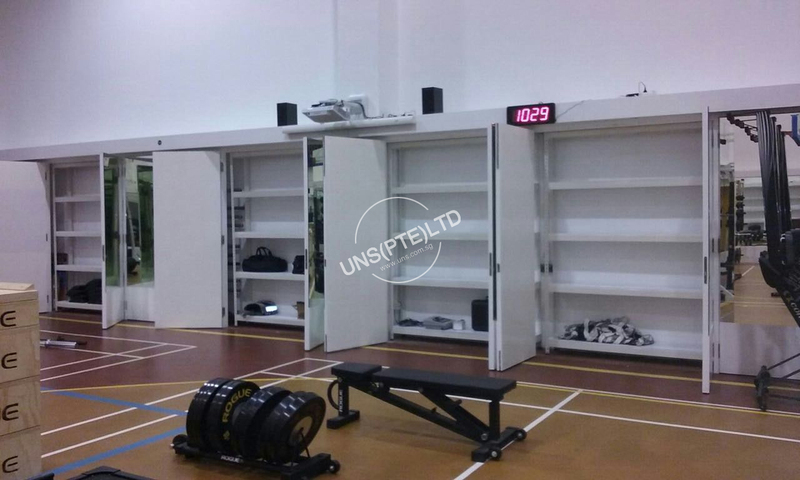 UNS Boltless Rack Storage System (Storage & Racking) are manufactory from Malaysia with SIRIM QAS INTERNATIONAL Standard Certification. 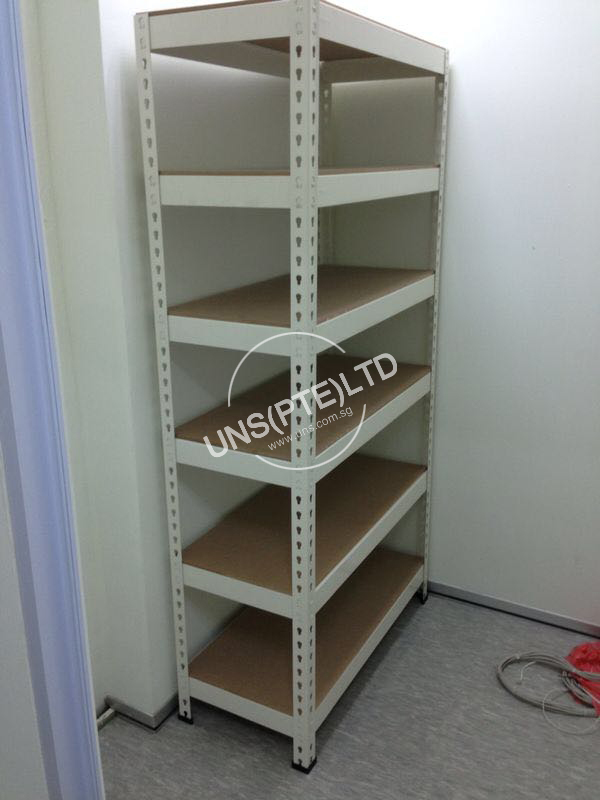 Our Boltless Storage Racking System are easy and hassle free to install as they do not have bolt and nuts. 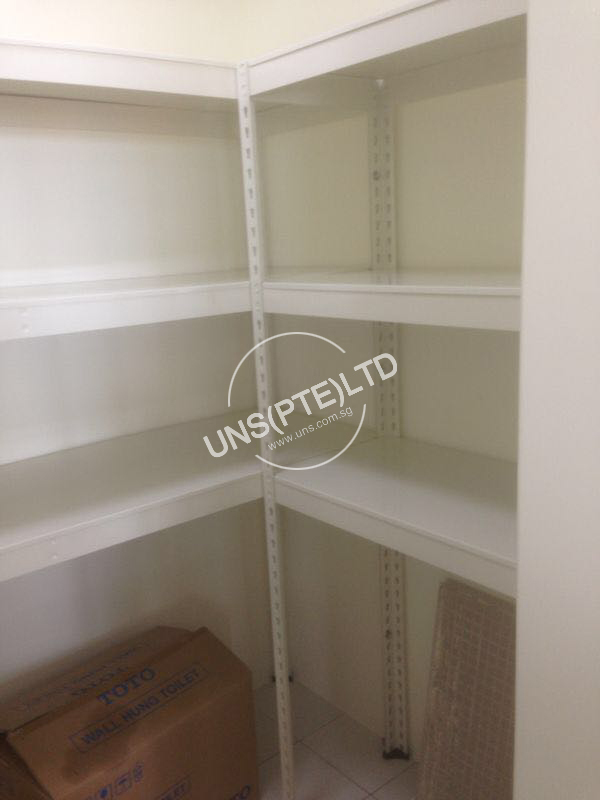 These shelving are easily latched on to the upright bar. 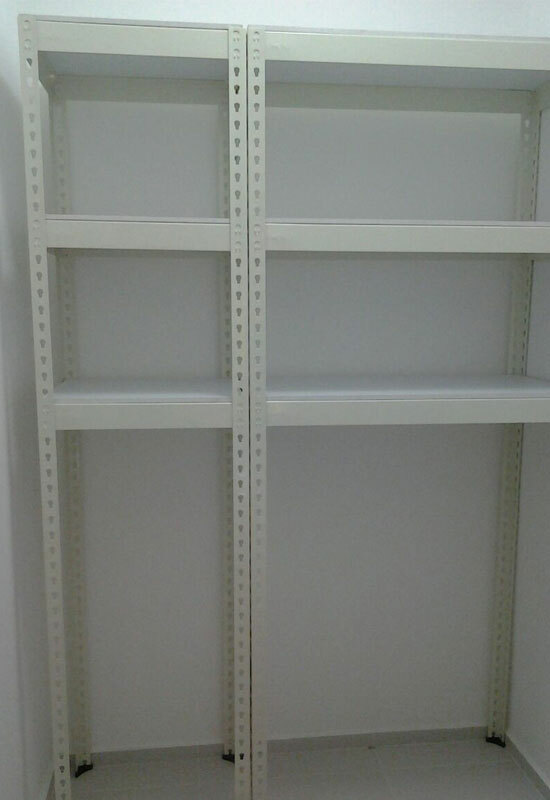 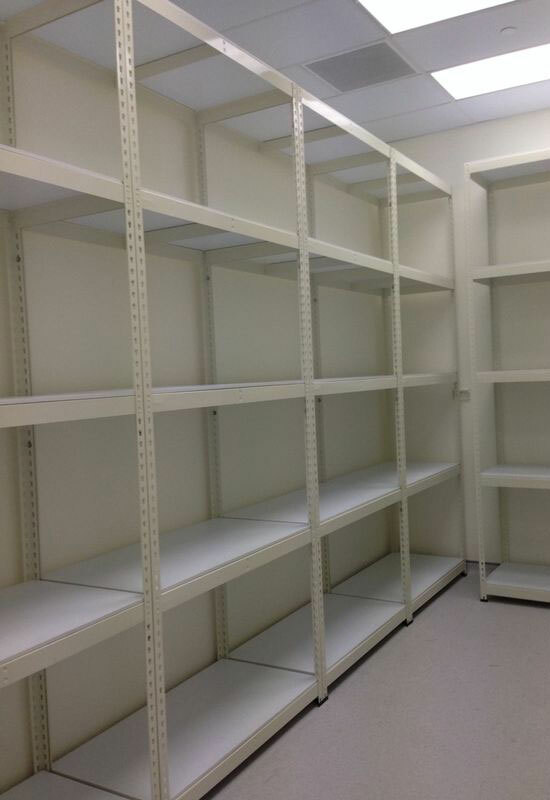 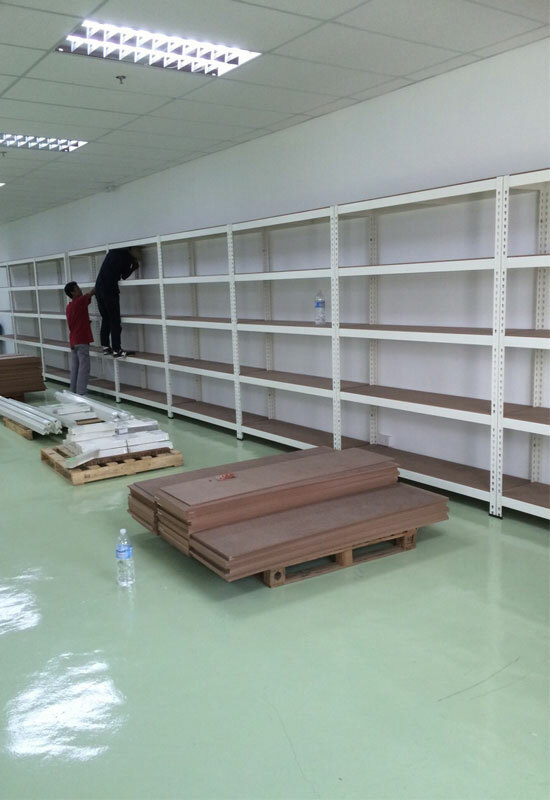 You may choose the level that you wants to secure your shelve, depending on the internal height you require. 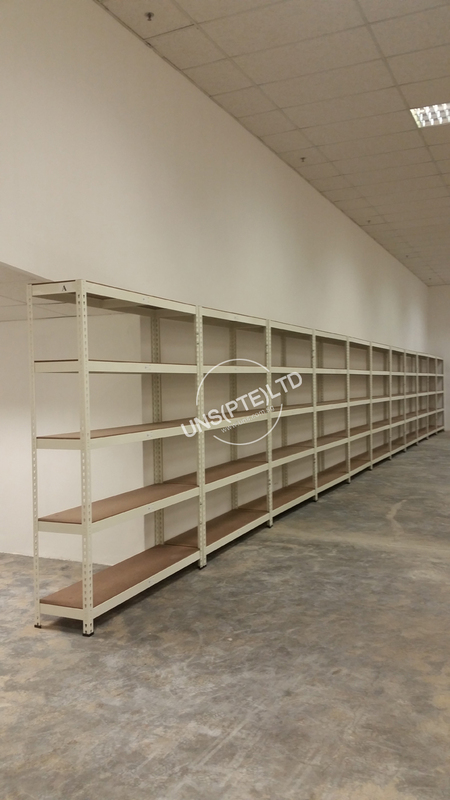 All Shelving is completely adjustable at your own discretion. 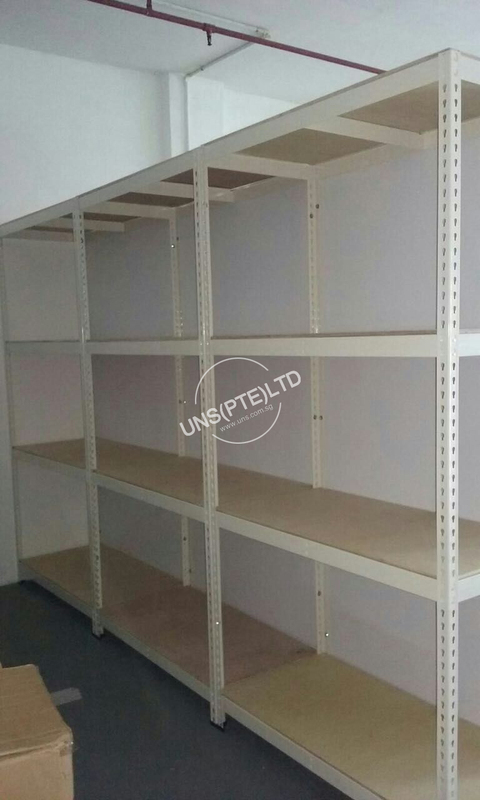 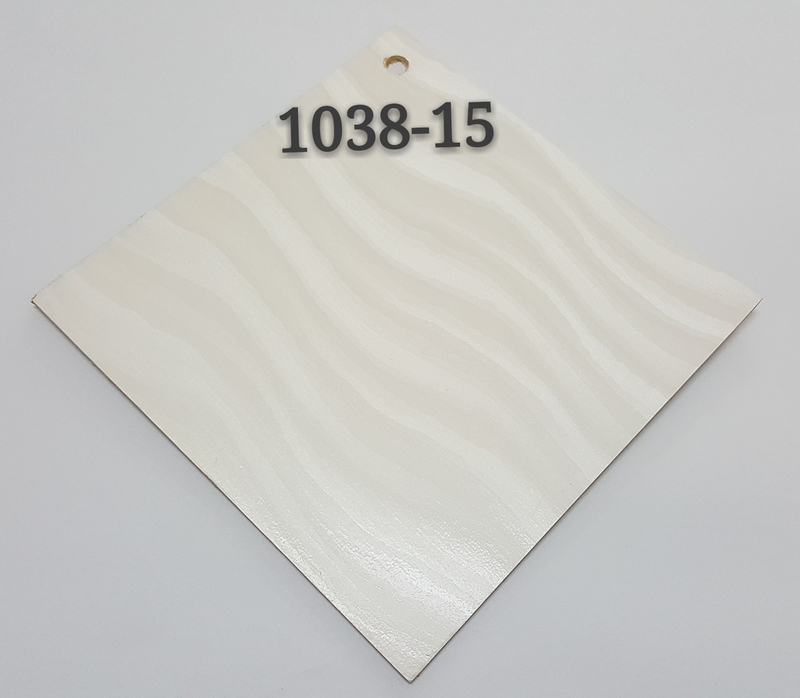 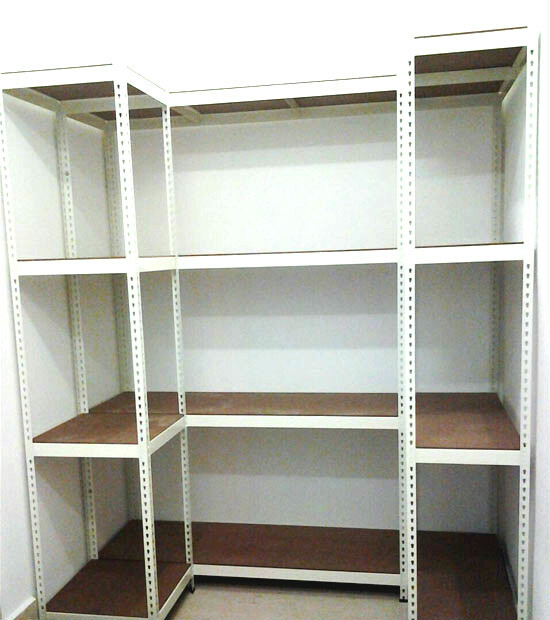 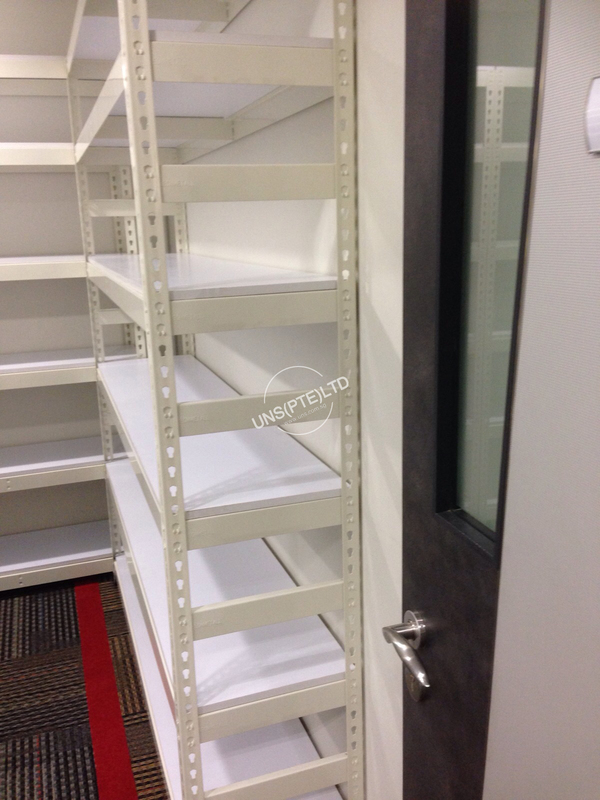 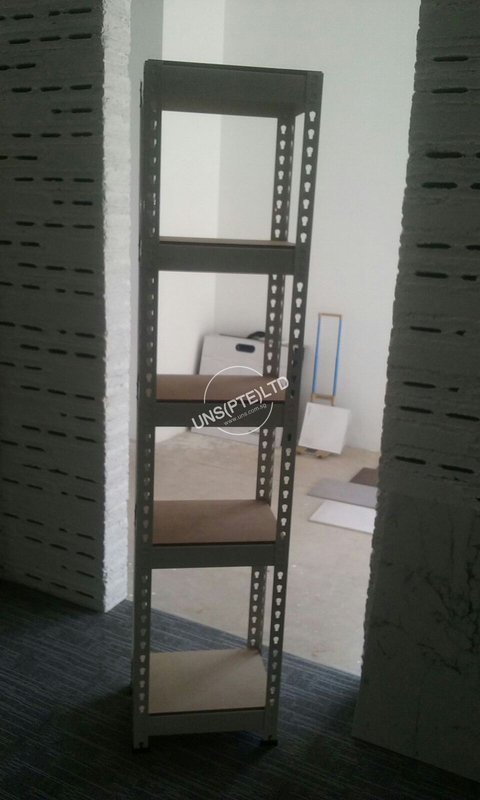 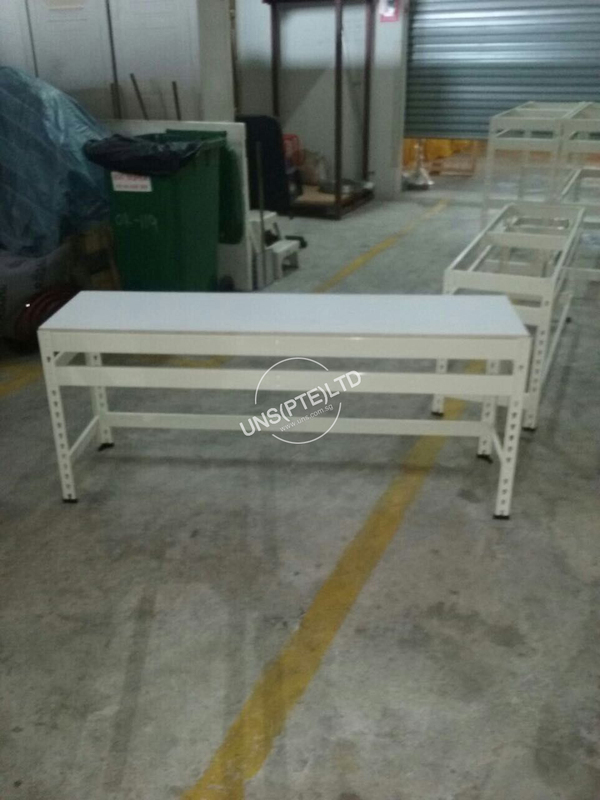 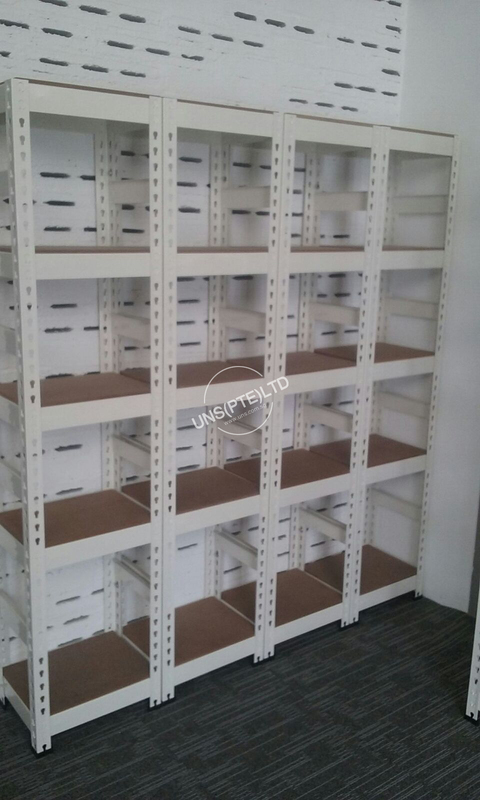 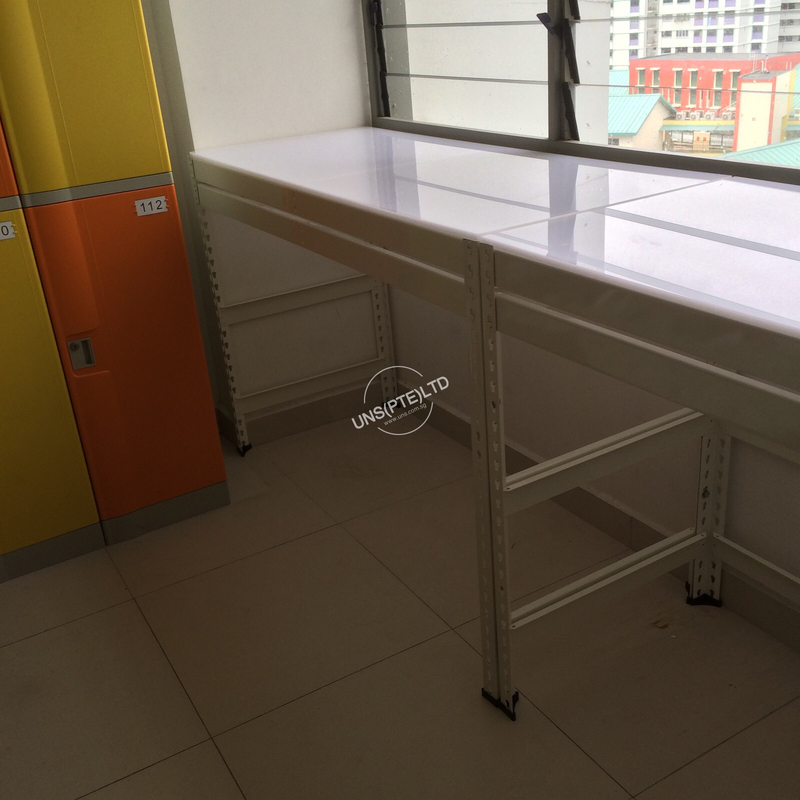 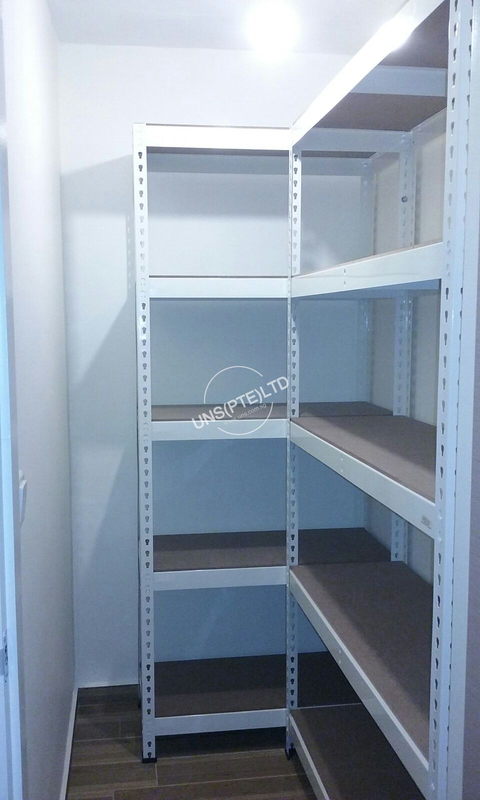 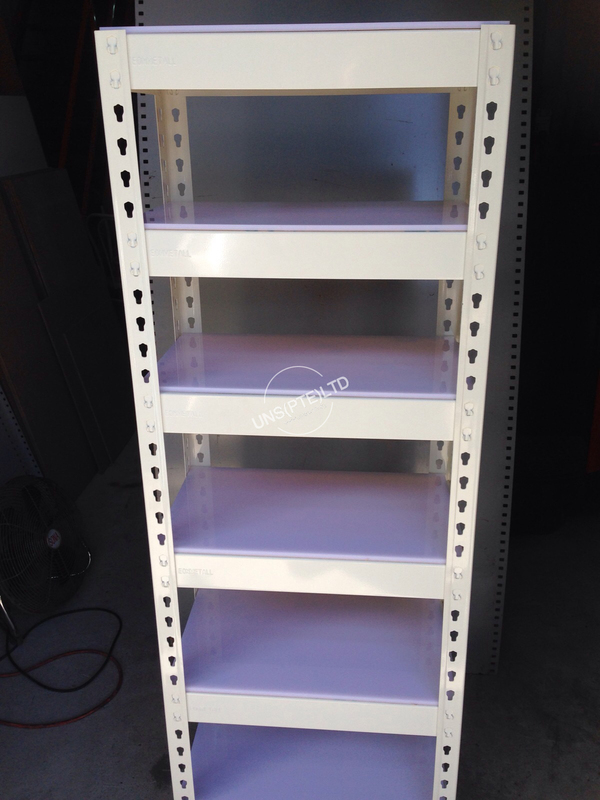 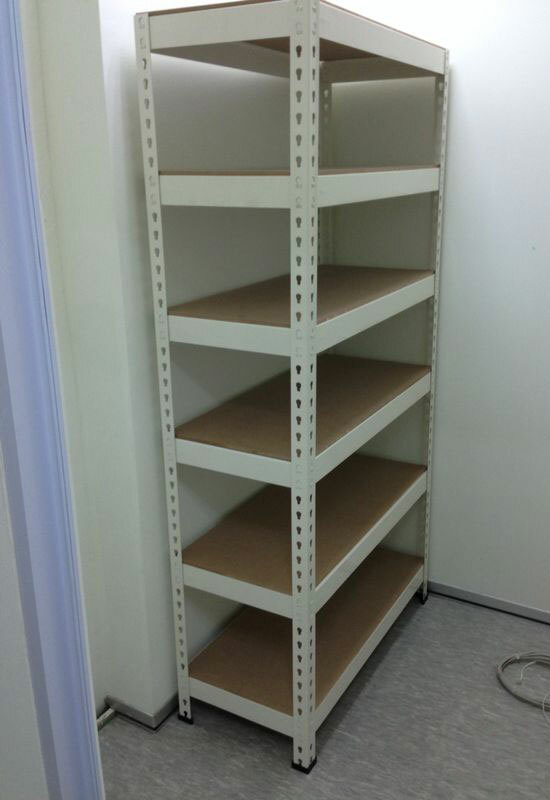 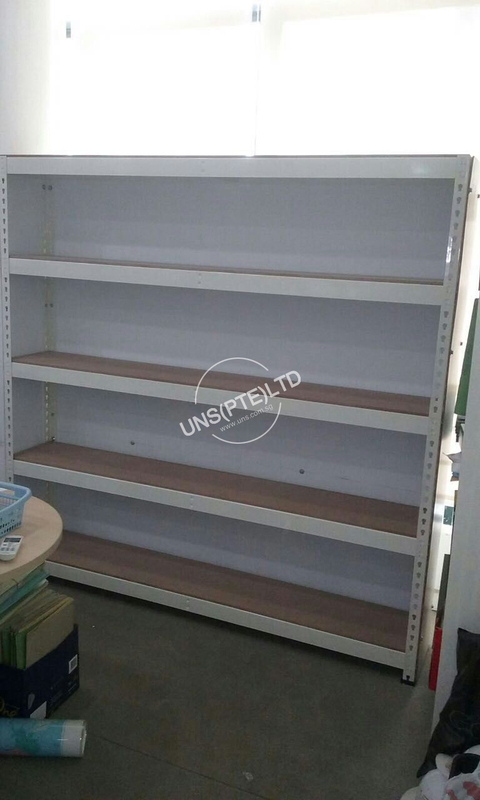 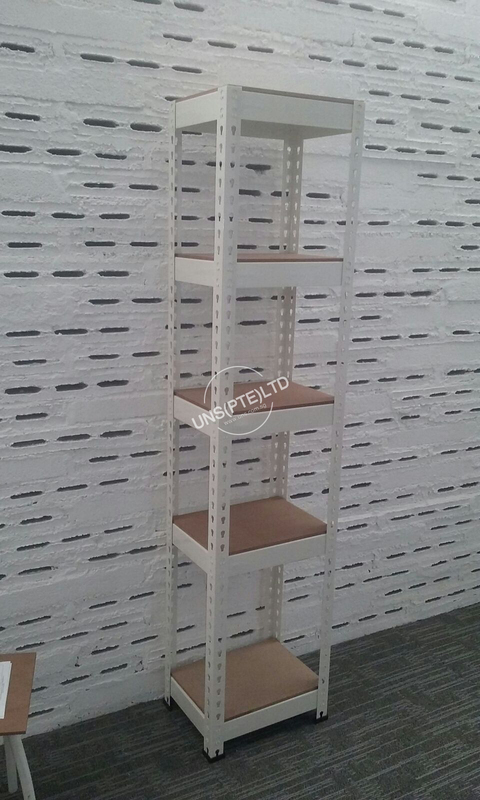 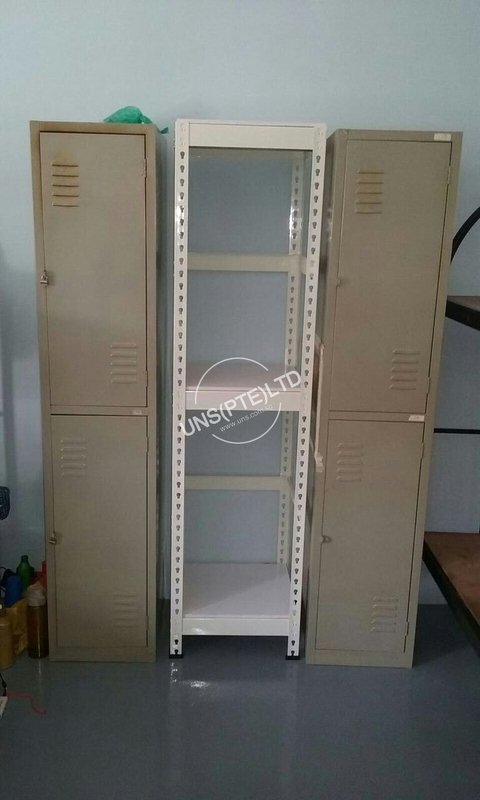 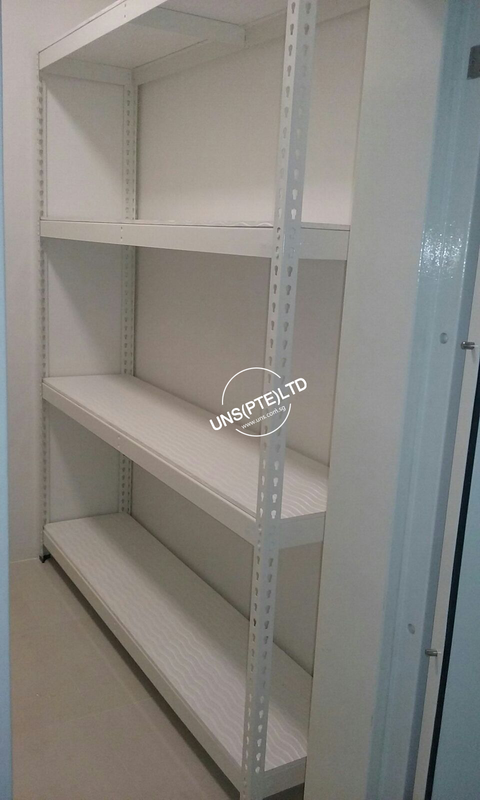 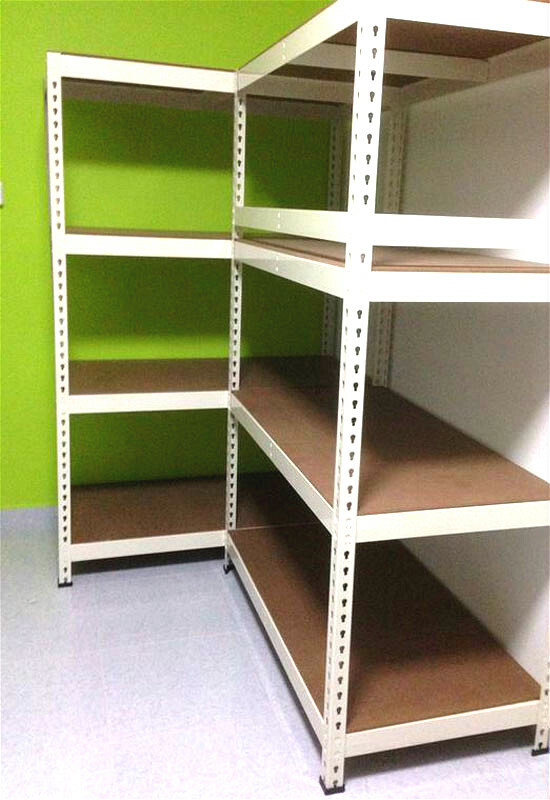 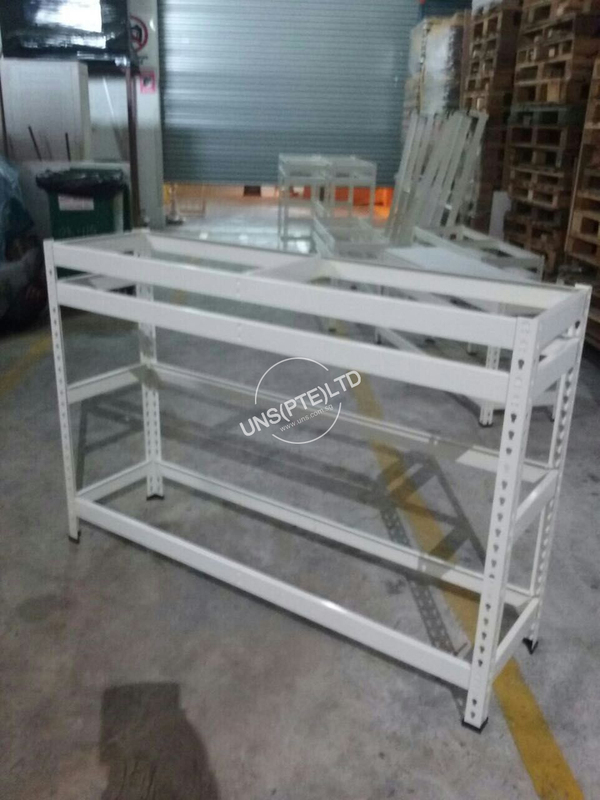 Beige (off white) Boltless racking are finished with high quality Epoxy Powder coated with HDF Board (Anti Termites treated). 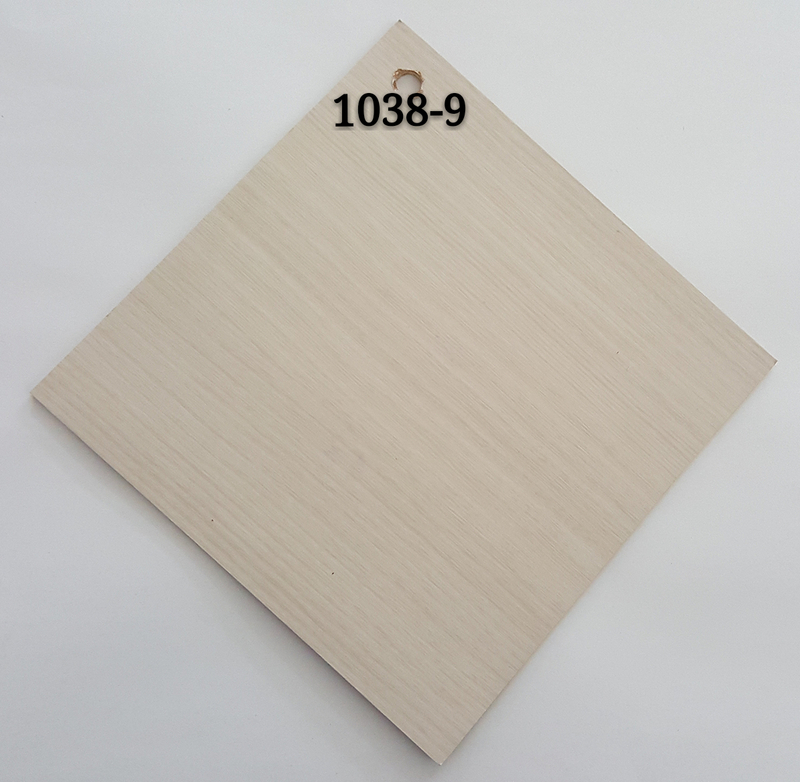 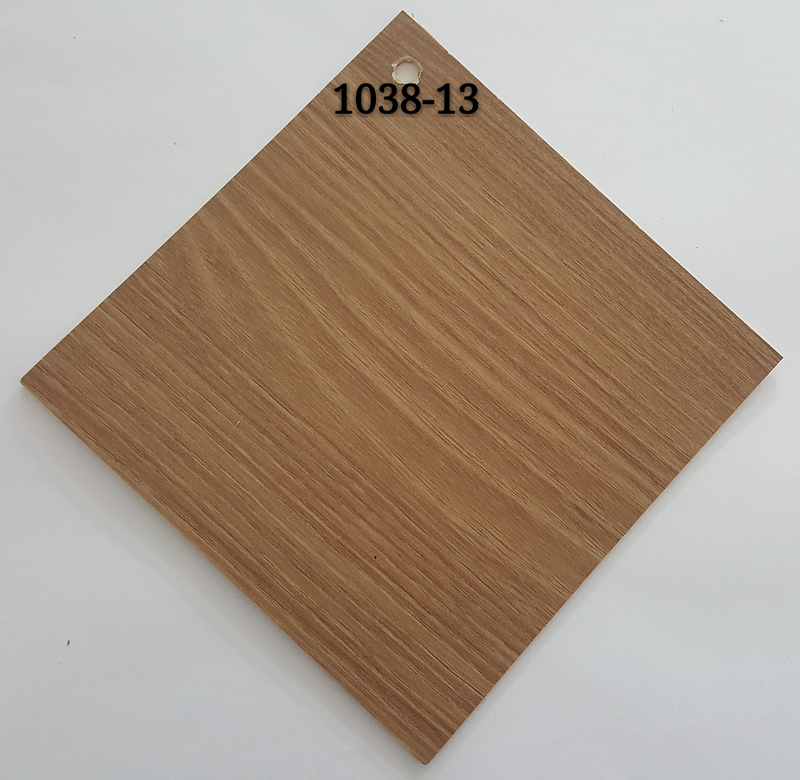 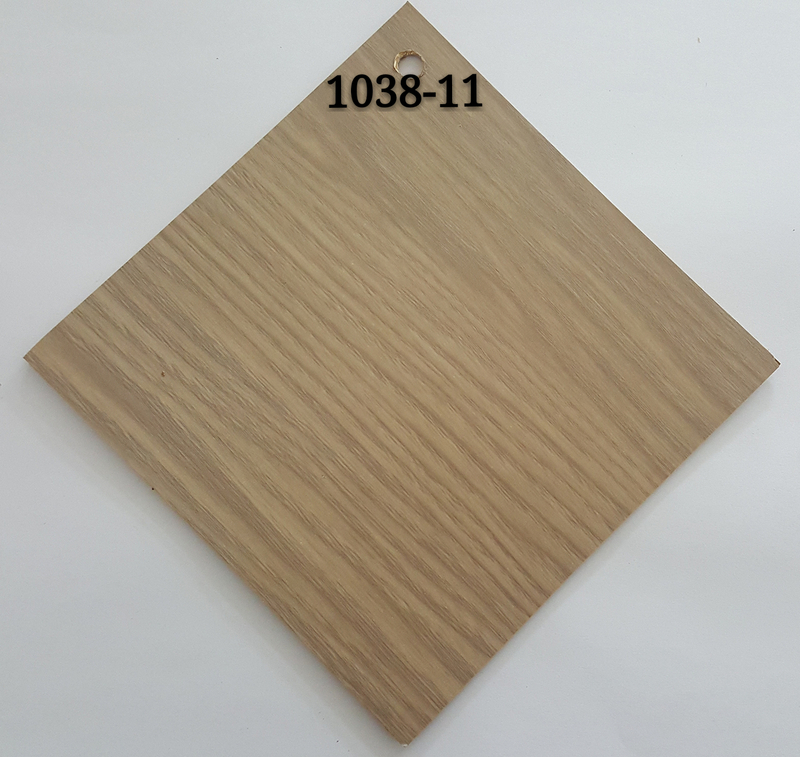 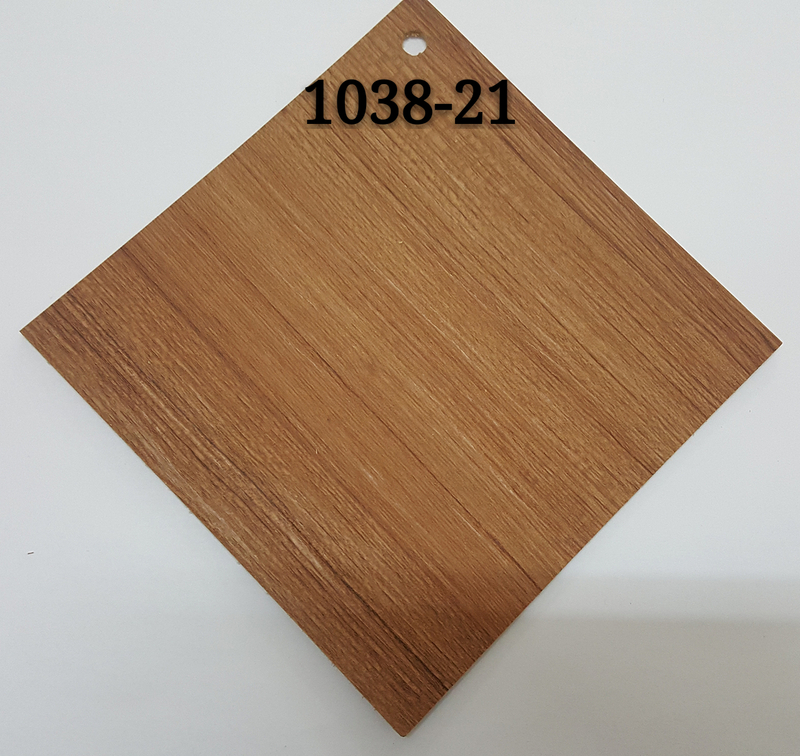 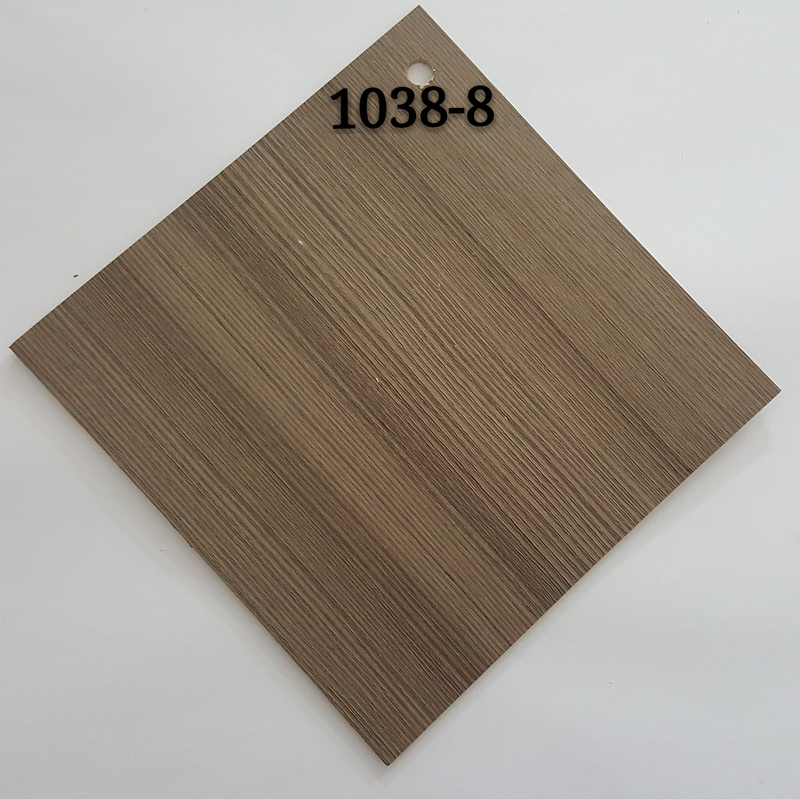 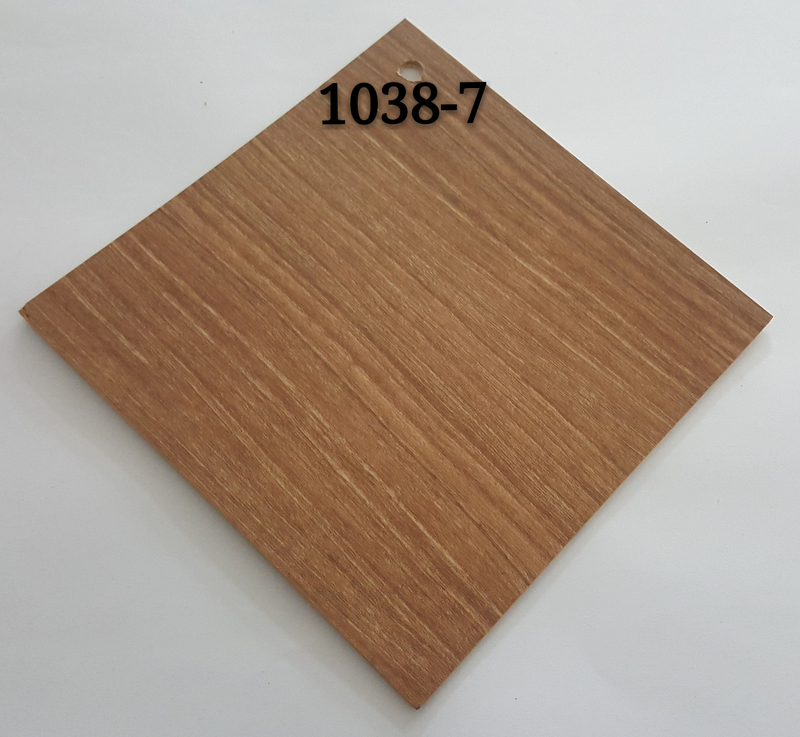 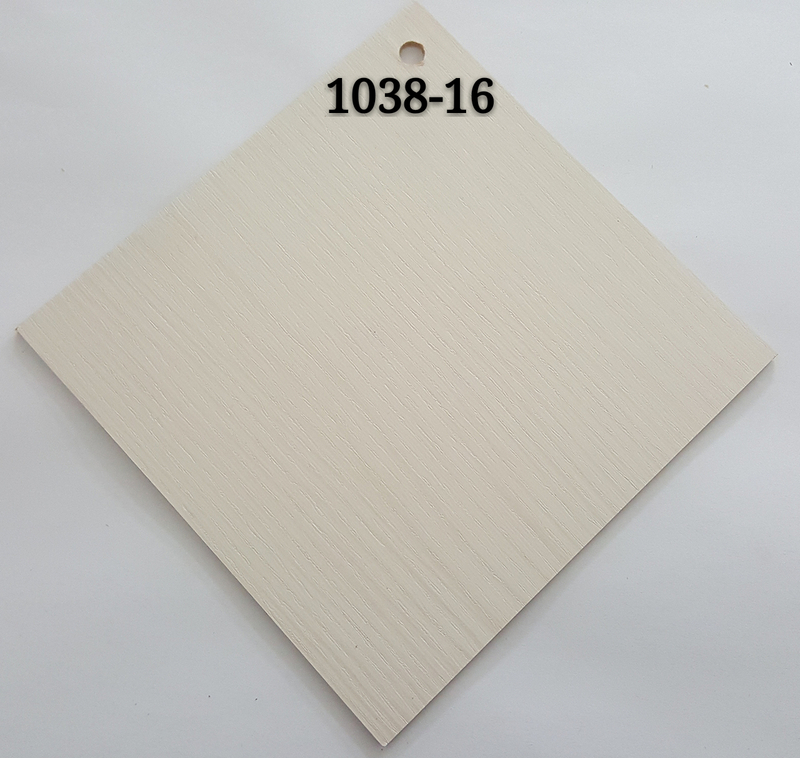 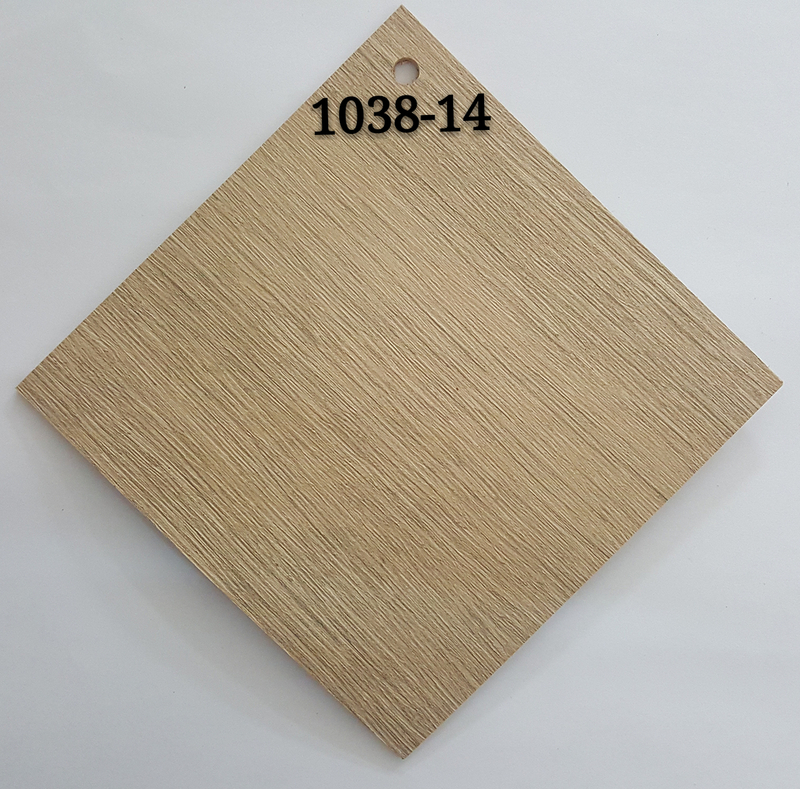 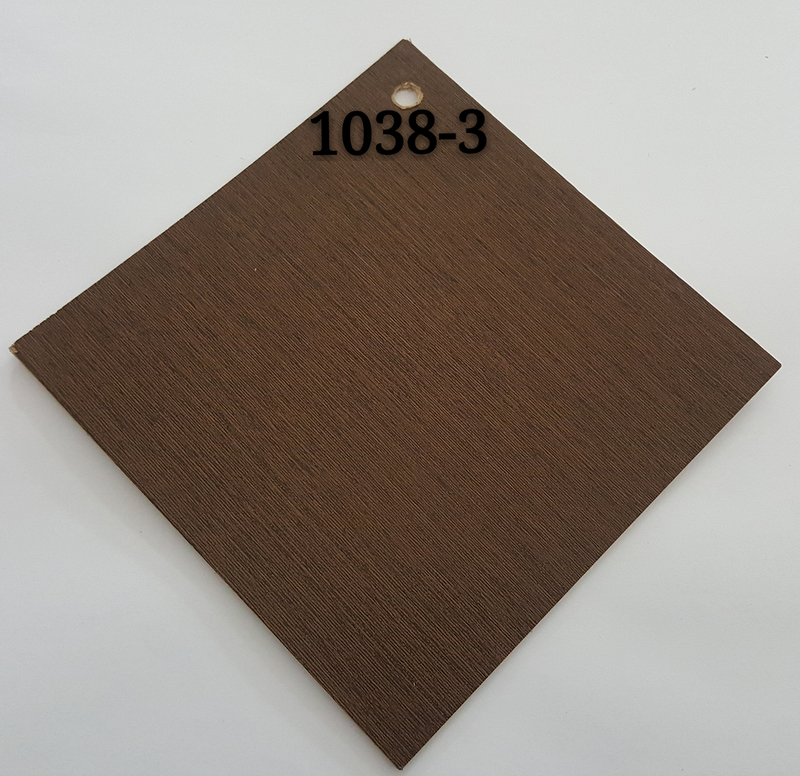 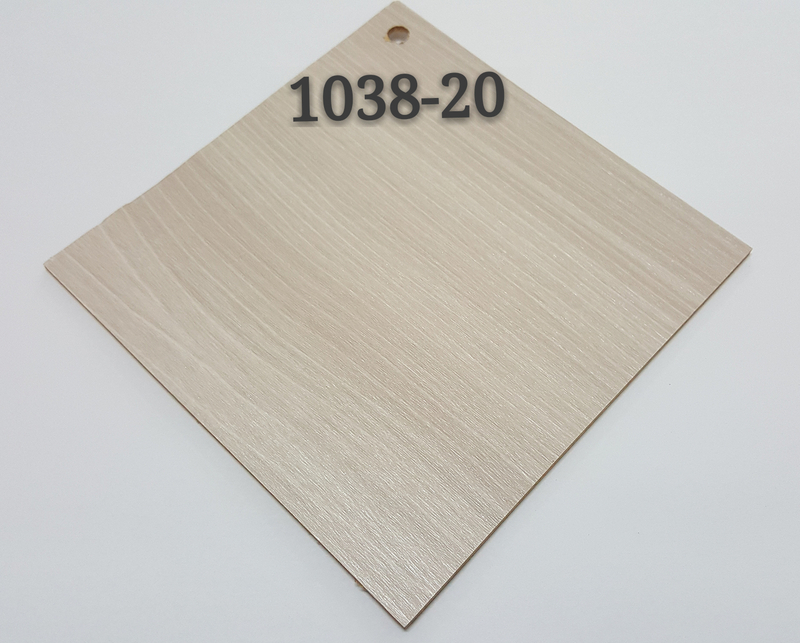 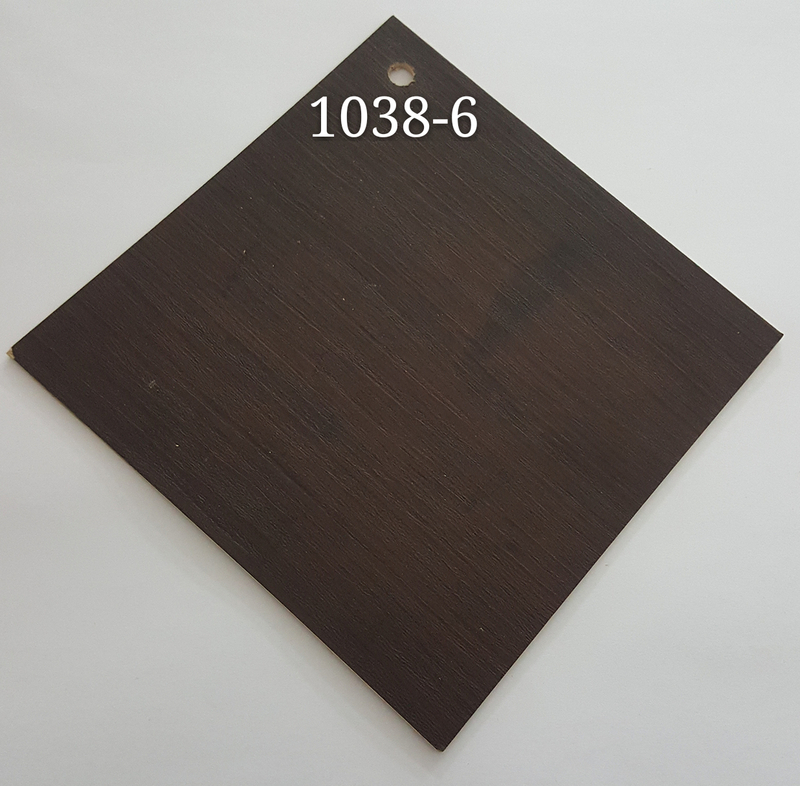 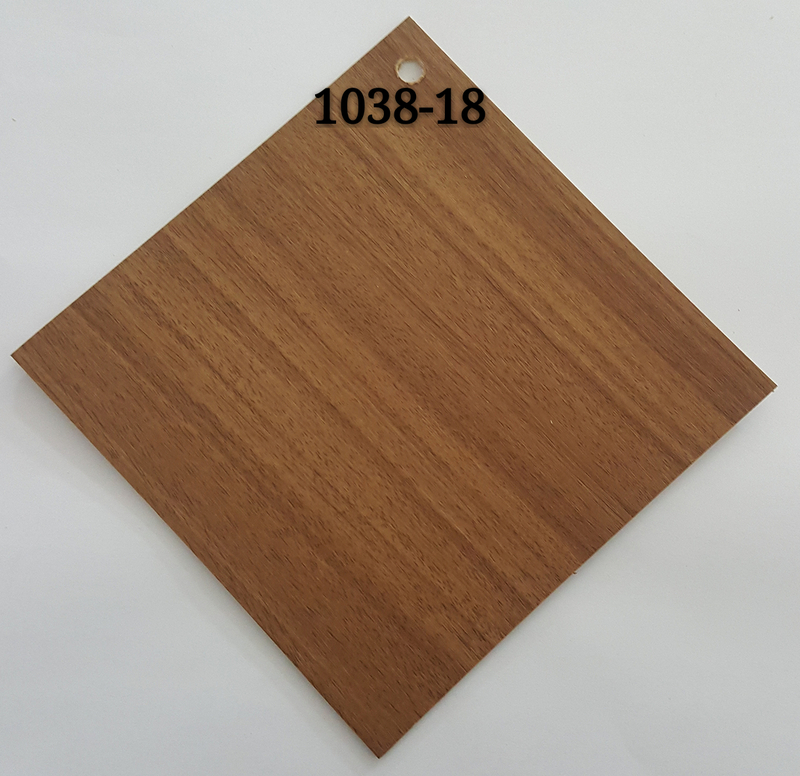 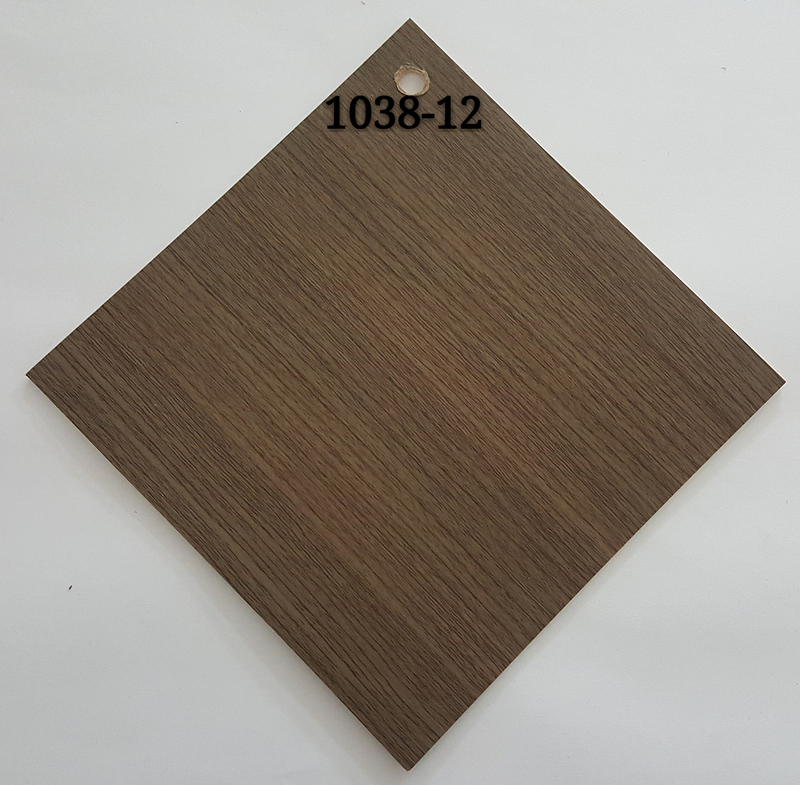 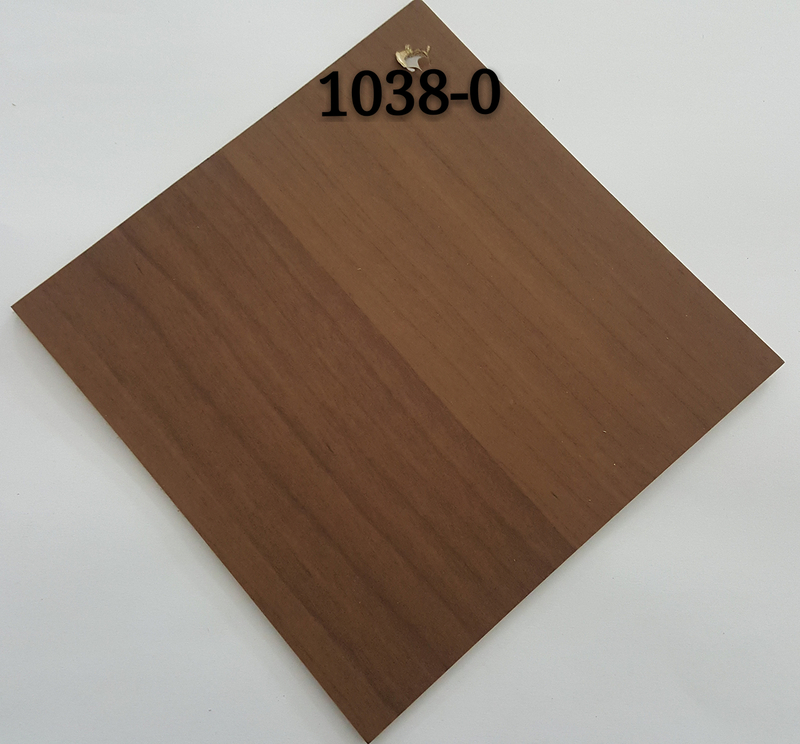 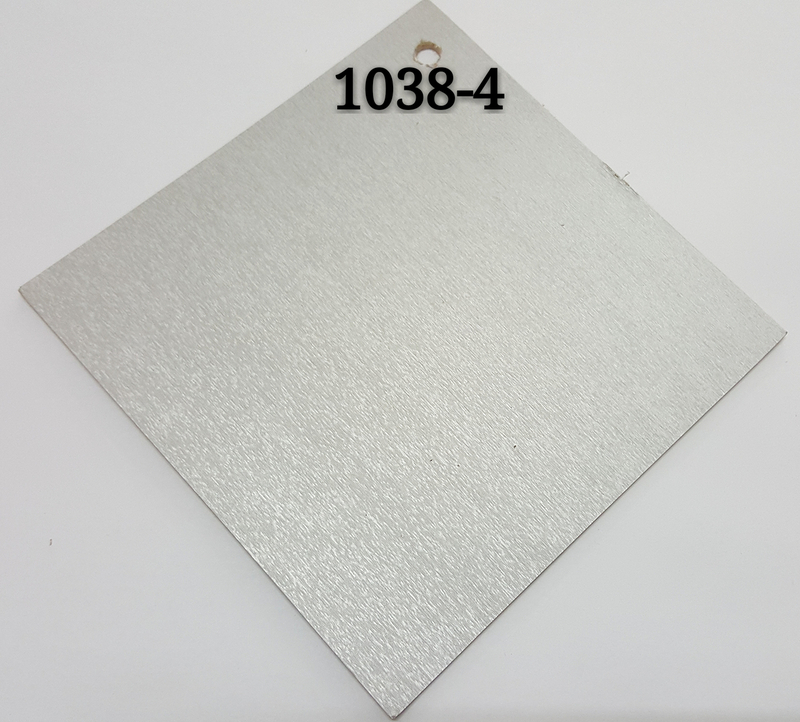 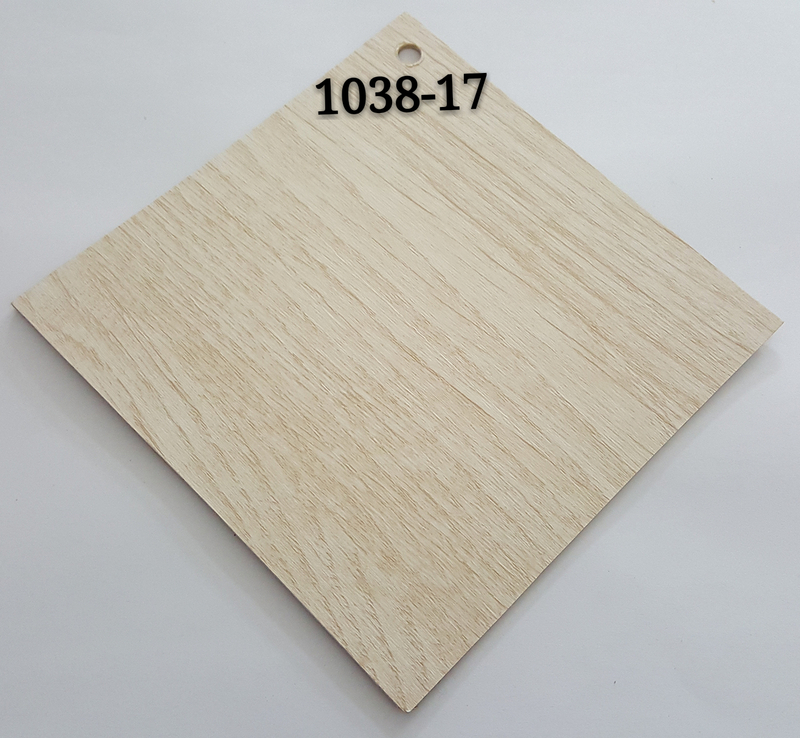 You can chose PVC Laminated Plywood or Full Metal panel to suit your need. 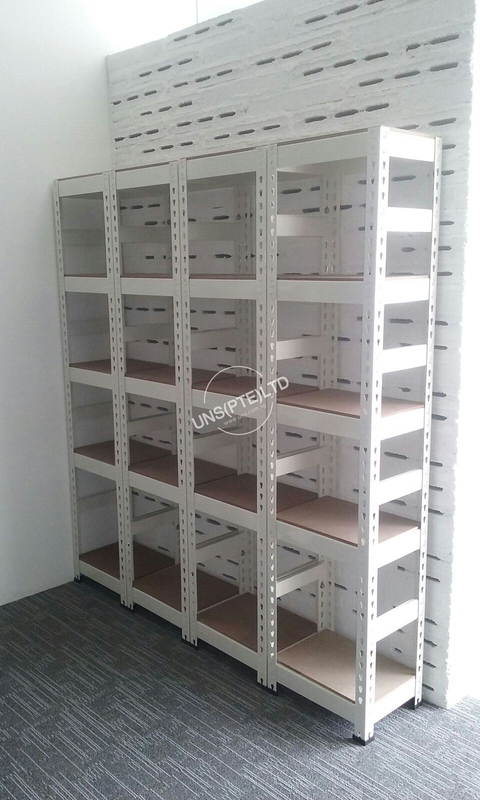 Each level can withstand 150kg – 400Kg UDL. 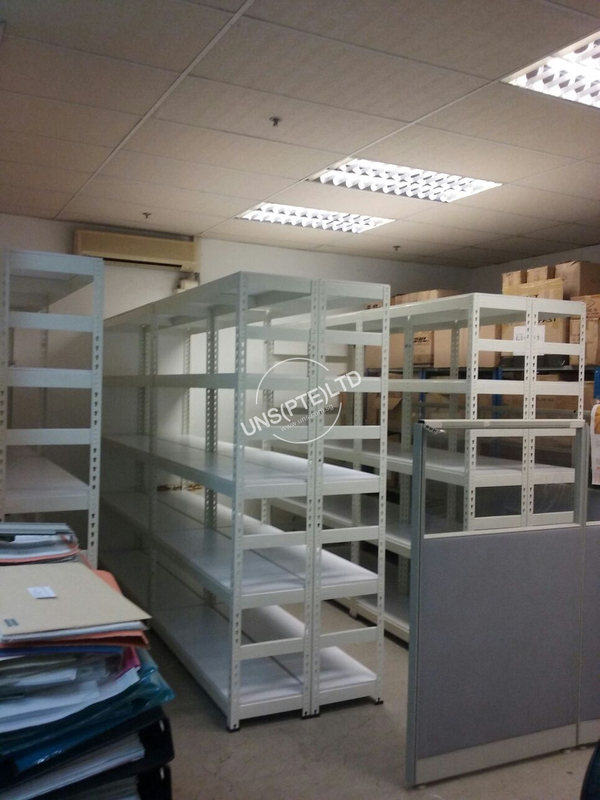 Please feel free to contact us through the Live Chat or email to us if you have any enquiry. 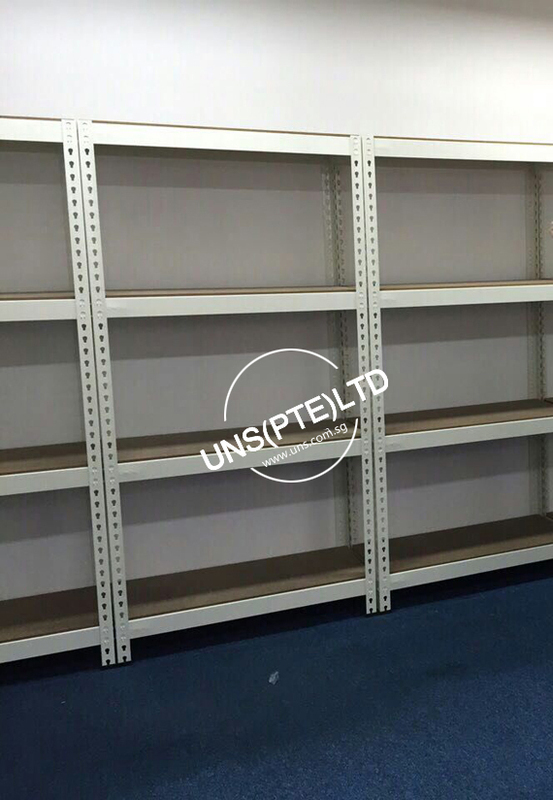 Rack system is a Light weight adjustable shelving system come with adjustable shelving (wood or metal) suitable for commercial, industrial and household storage solution. 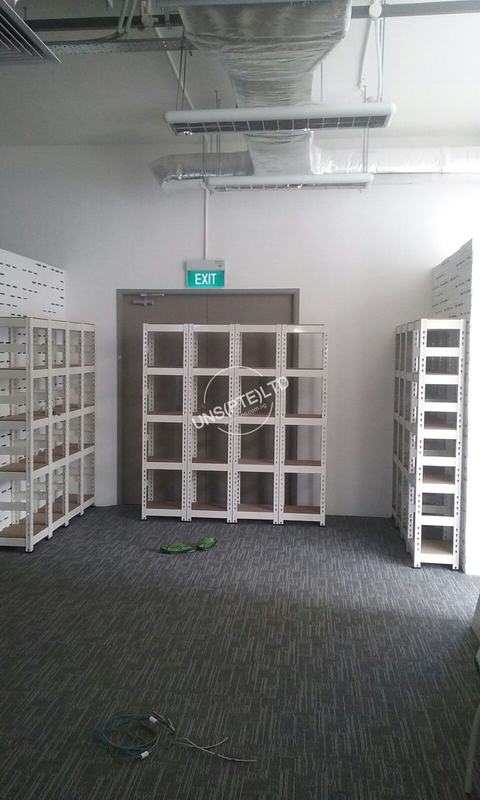 cater for new HDB bomb shelter / store room / utility room and private condo ‘plus 1’ room are available in following series. 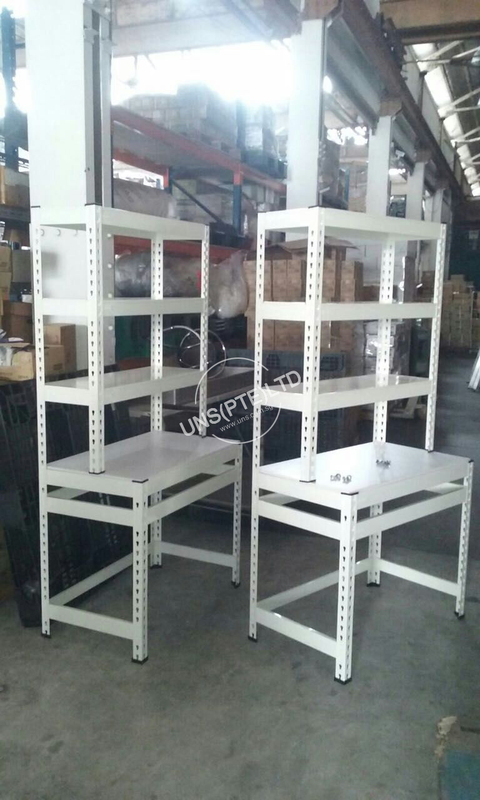 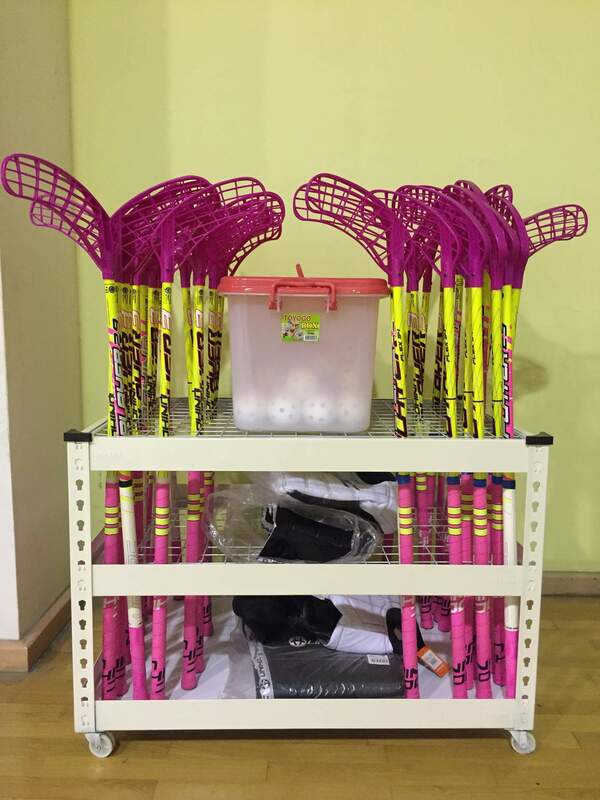 Easy and hassle free set-up without requirement of special tools. 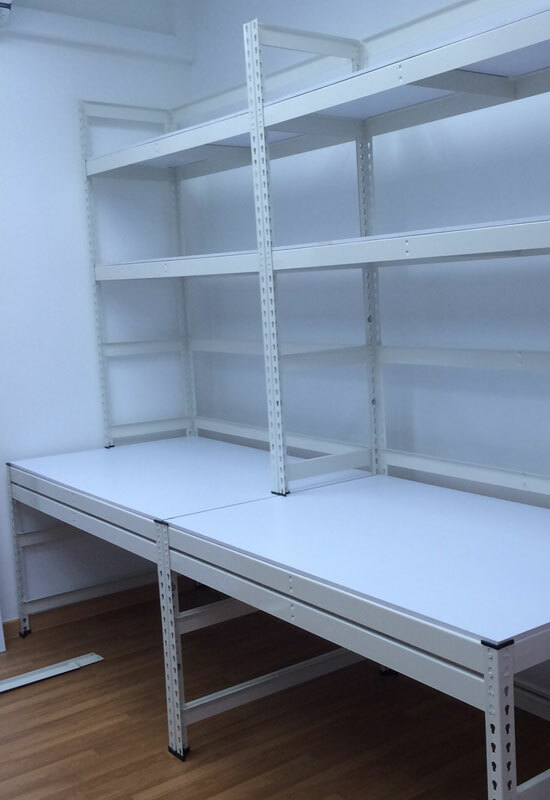 Modular design concept perfect for future extension or re-location. 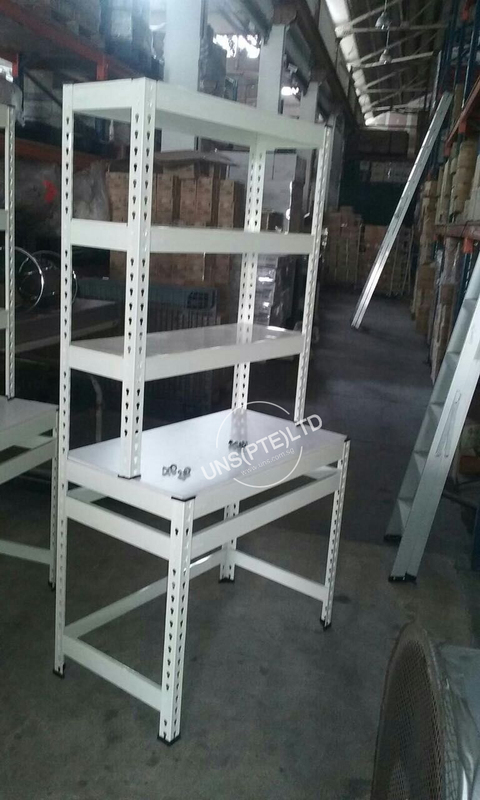 Light weight and boltless concept - bolts & nuts free. 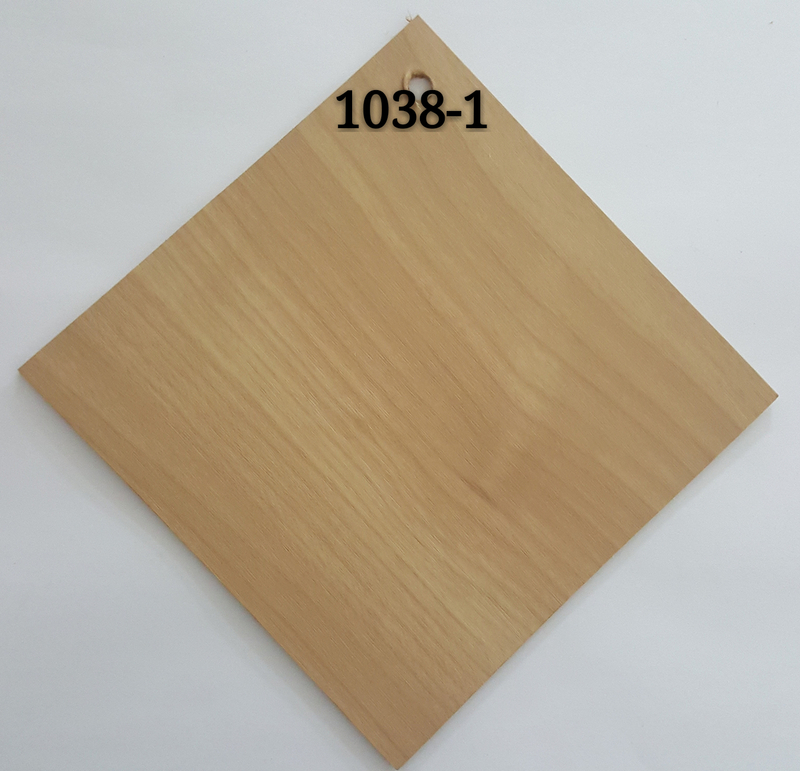 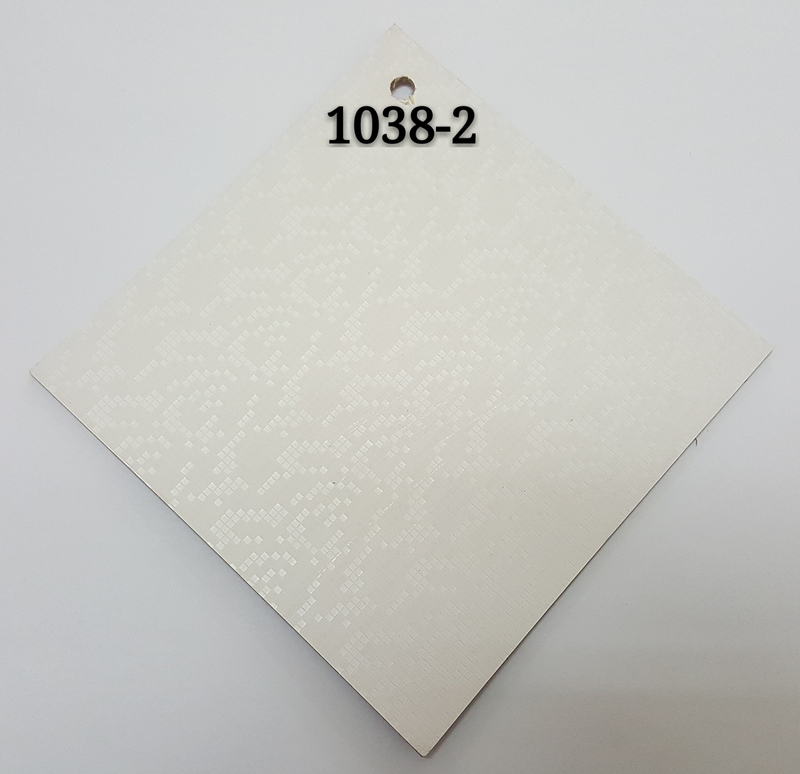 User friendly with round edge corner design and anti-slip rubber base. 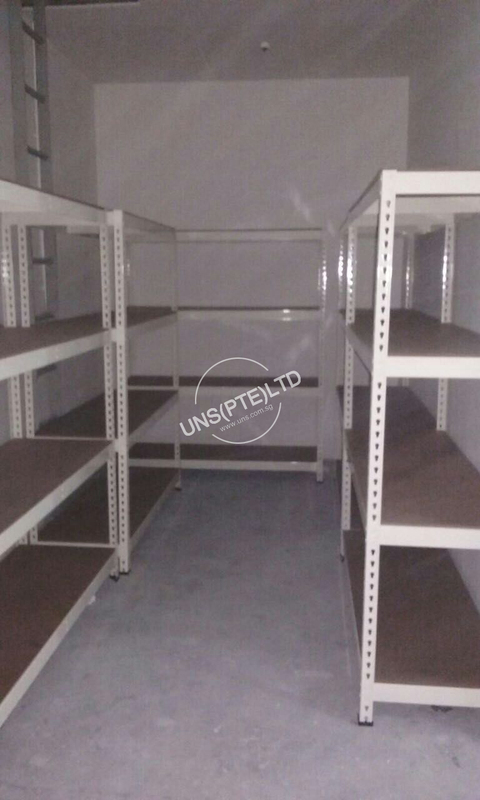 Versatile and flexible for maximum utilization of empty space. 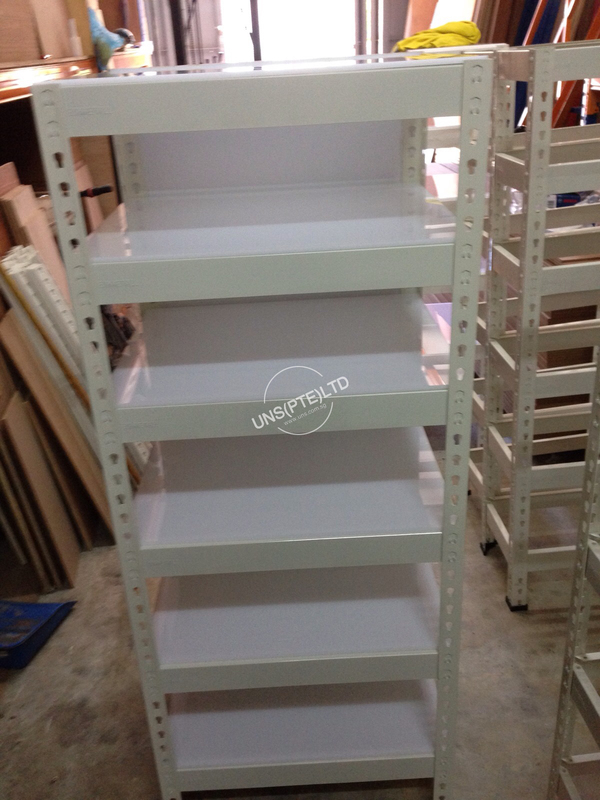 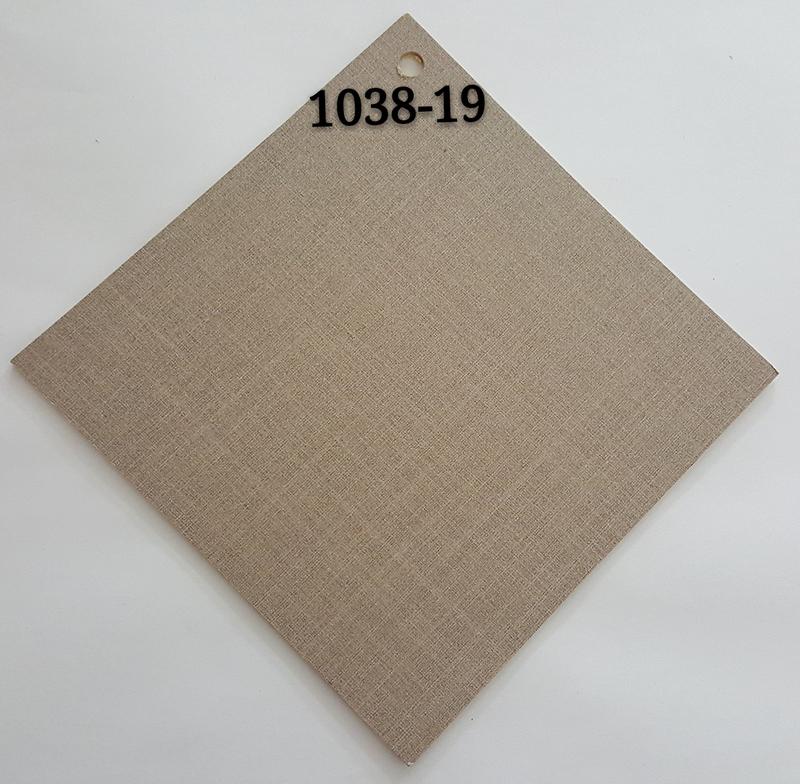 Available in standard Beige (off White). 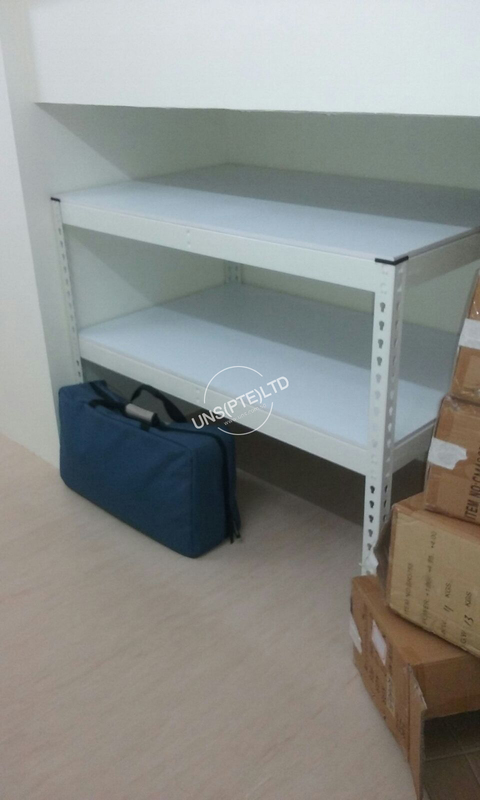 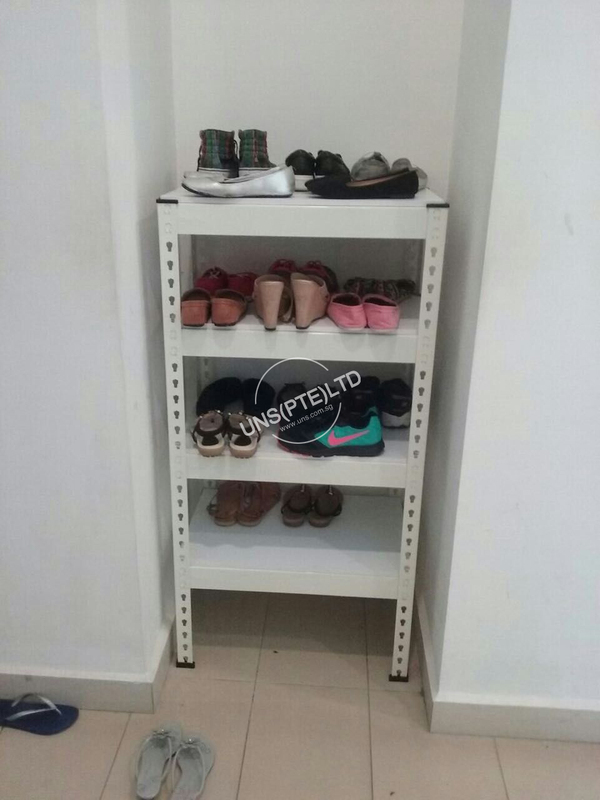 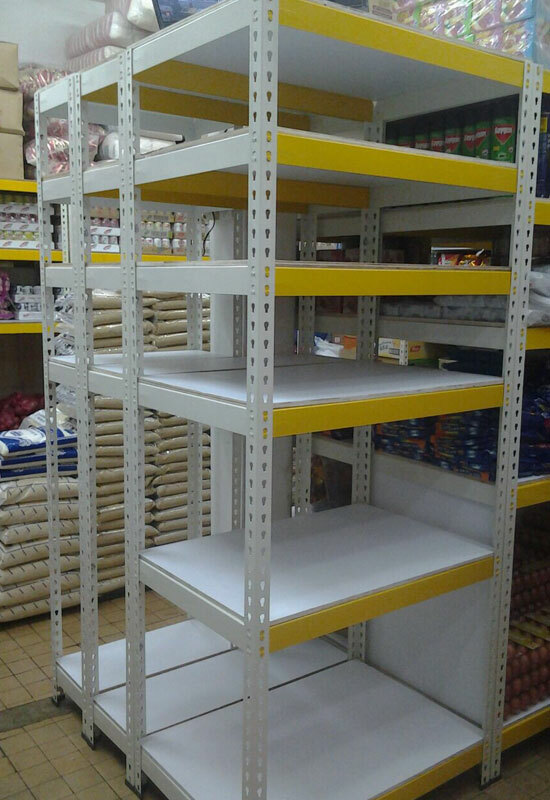 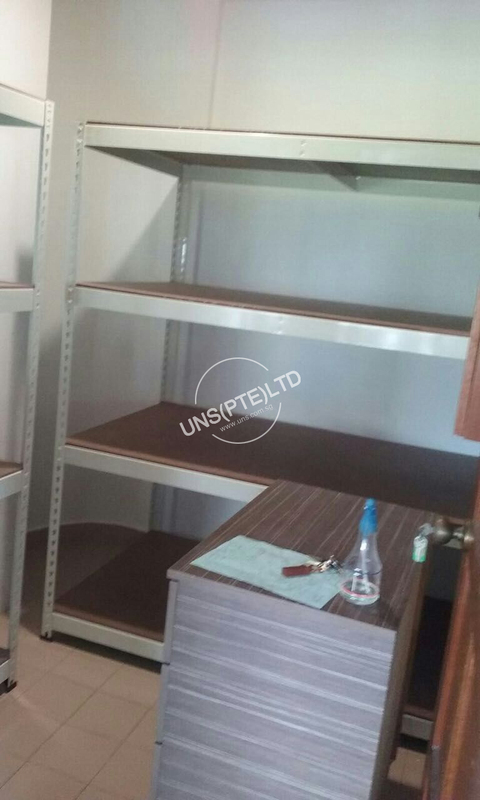 Shelves are easily adjusted at pitch of 40mm and are designed with load bearing capacities with 150kgs - 400kgs UDL per shelf level. 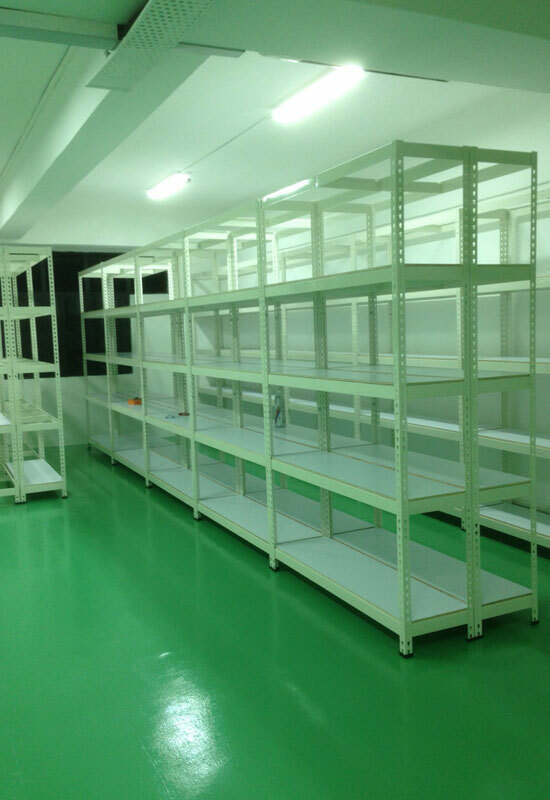 Come in standard Depth and Width. 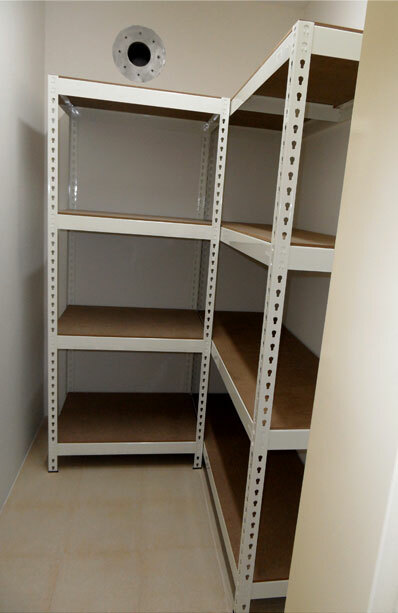 Height can be alter base on hole to hole. 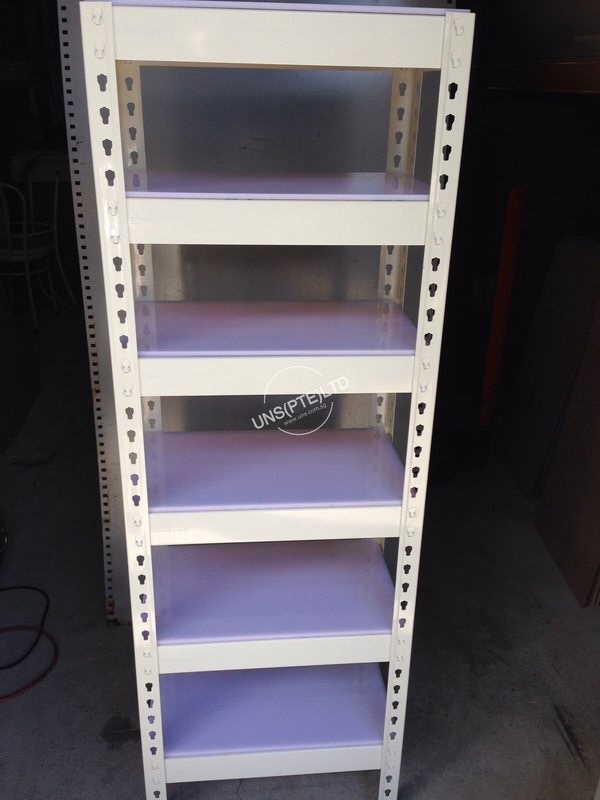 Finished with high quality Epoxy Powder coated.